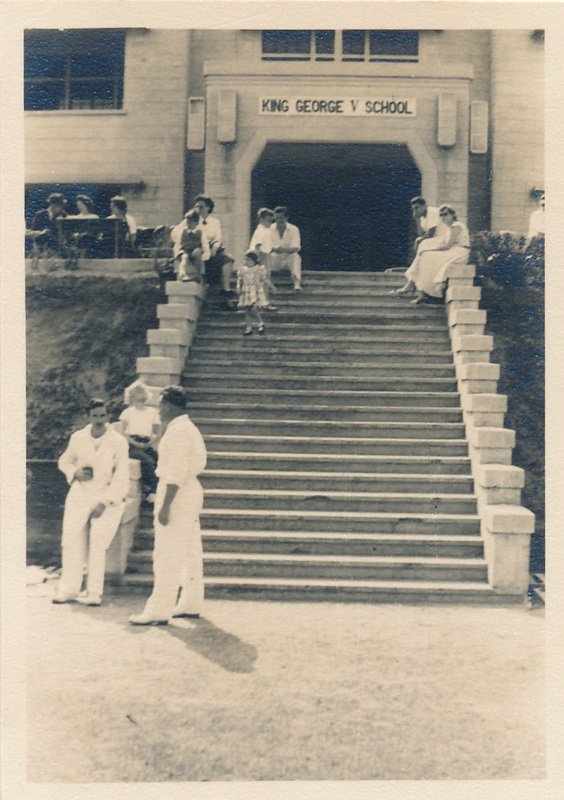 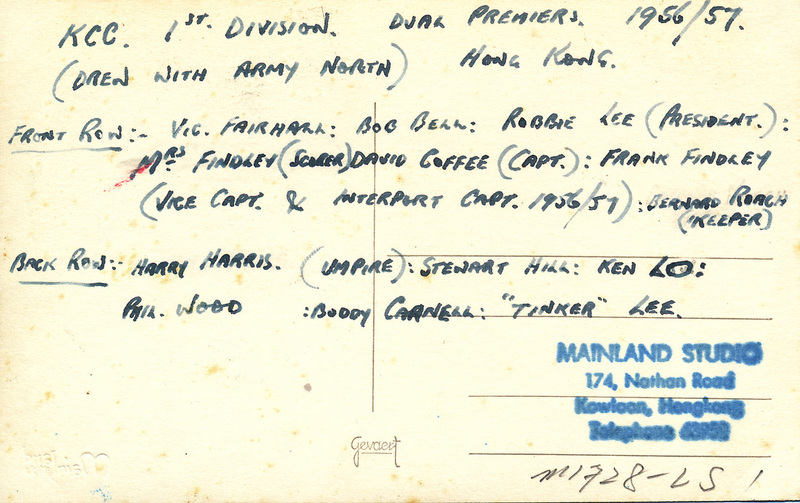 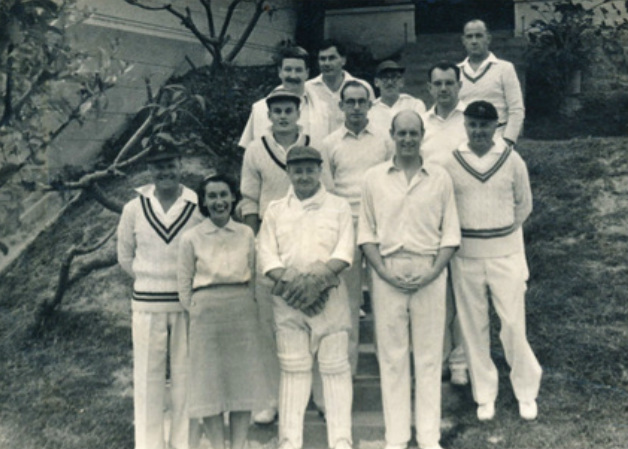 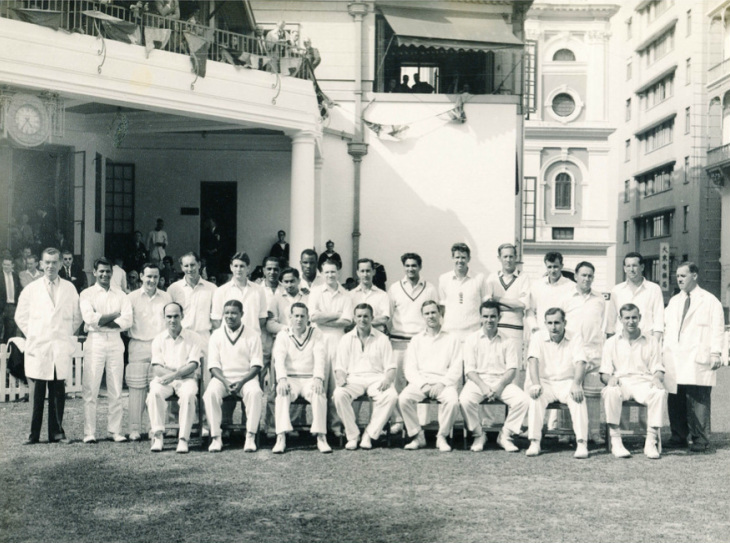 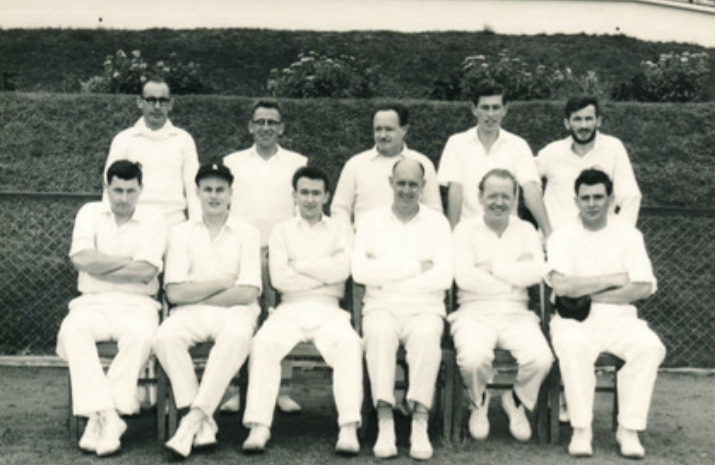 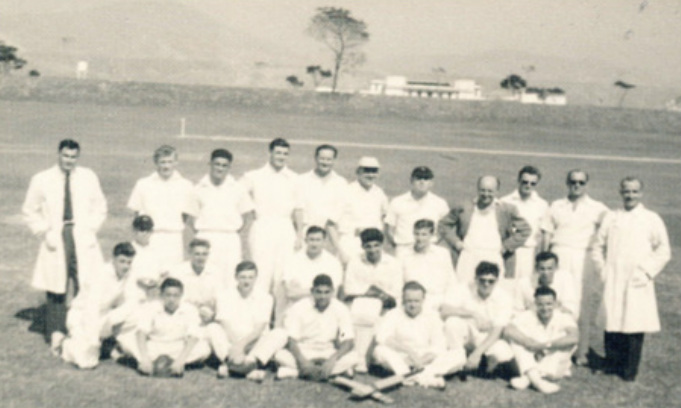 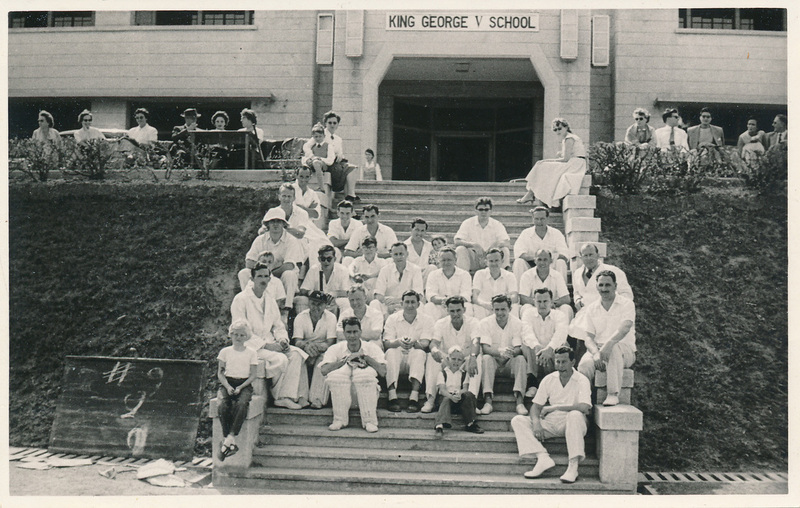 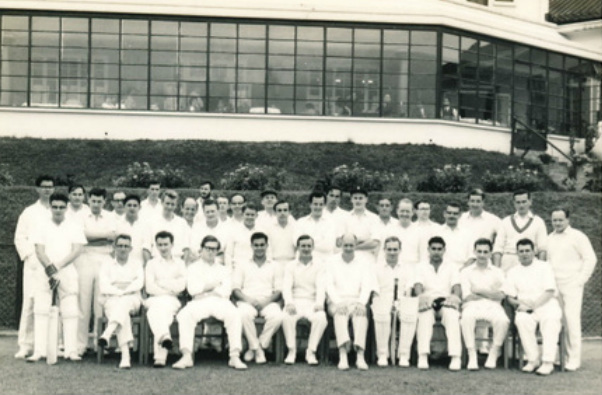 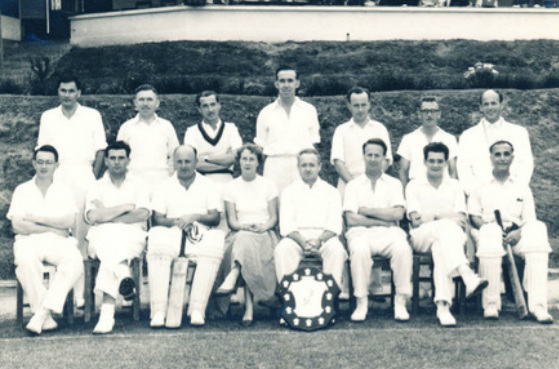 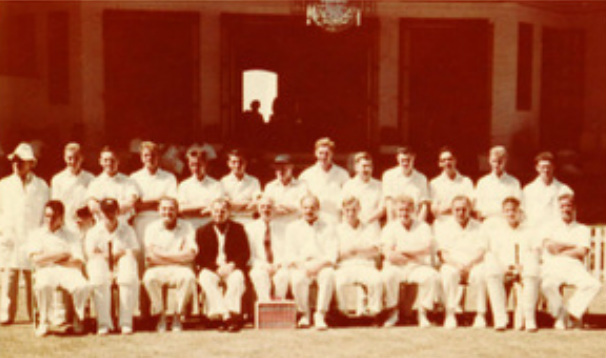 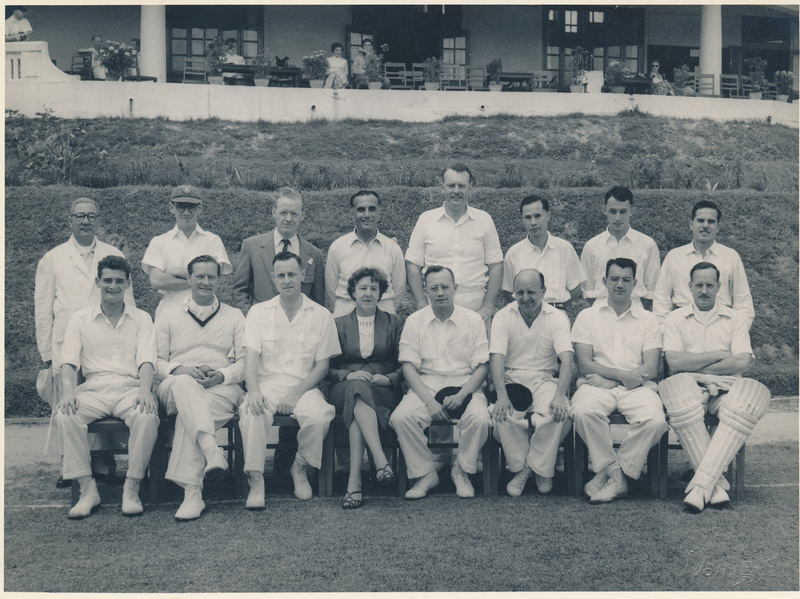 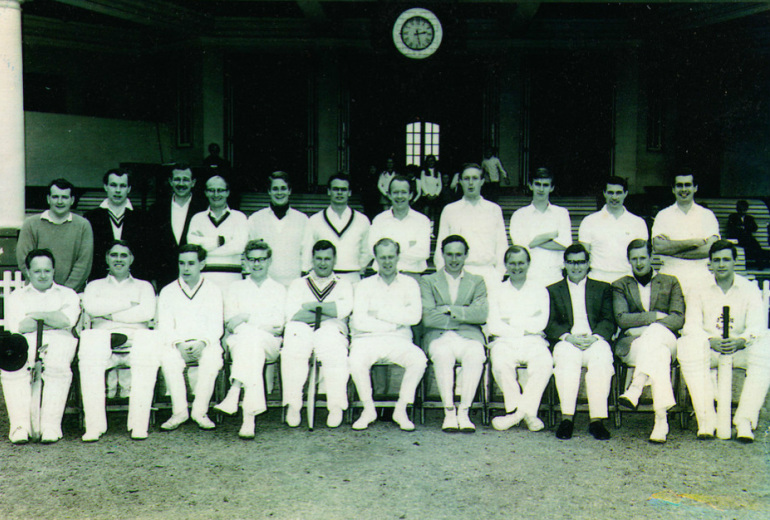 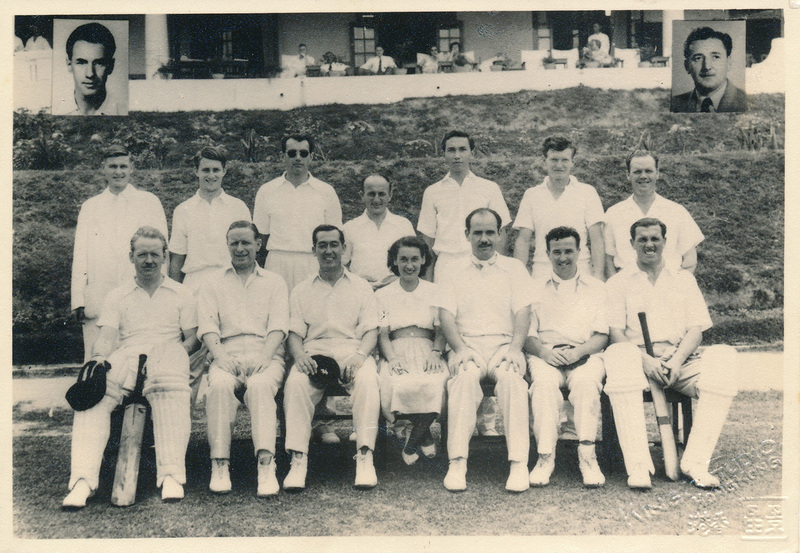 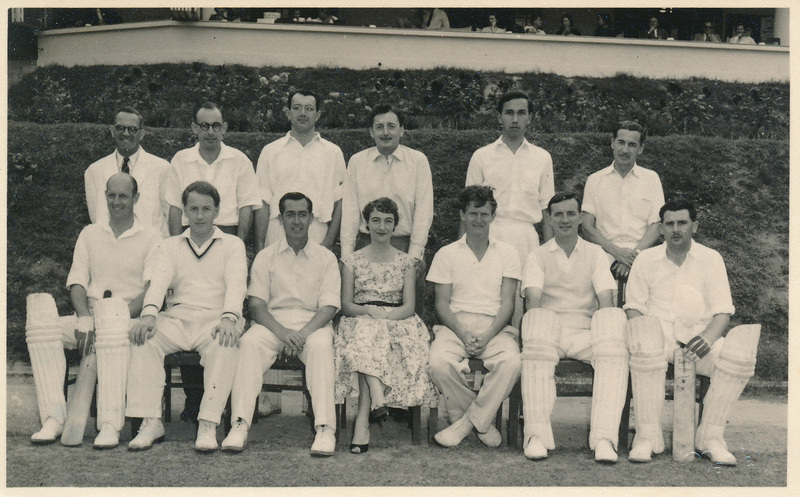 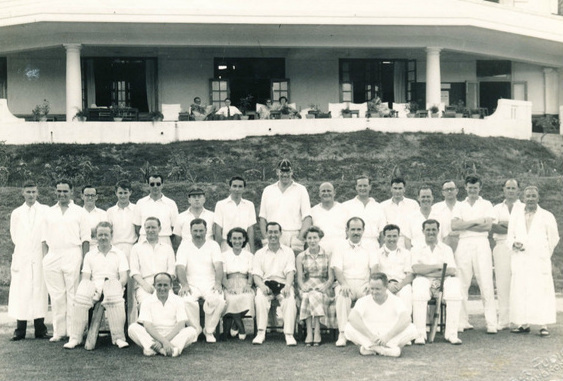 Above: 1st Grade League Winners 1954/55 Hong Kong. 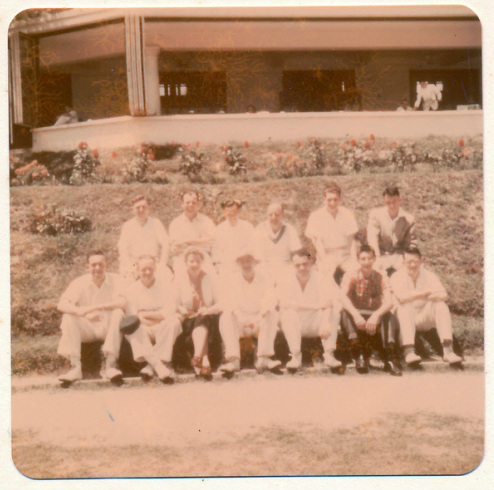 Back Row L to R: Ron Hall (Umpire), Mike Guilford, Ken Lo, "Taffy" Evans, "Buddy" Carnell, David Coffee, Joe Chamberlain. 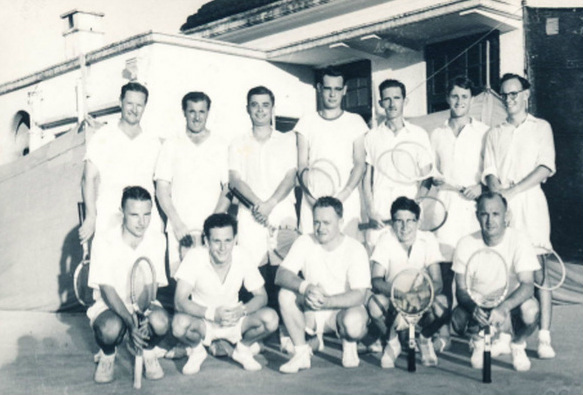 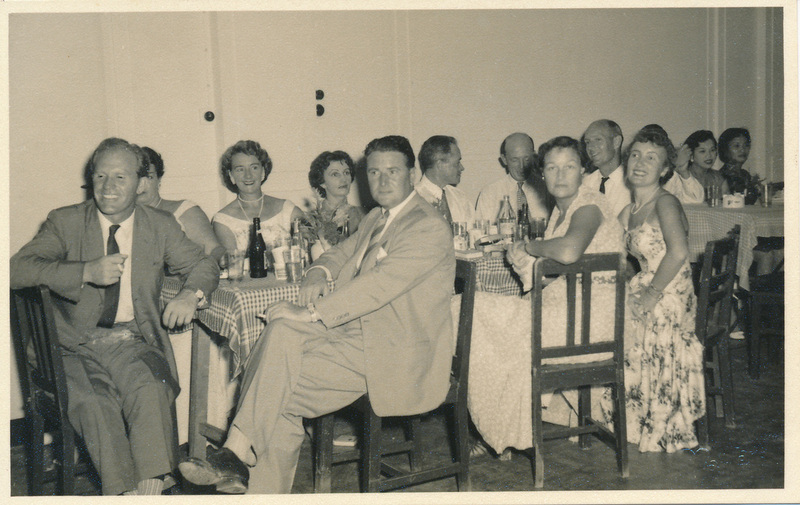 Front Row L to R: Reg Heron, Willie "Jock" Davidson, Robby Lee (President), "Mickey" Chamberlain (Scorer), Arch Zimmern (Captain), Pat Dodge, Bob Jenner. 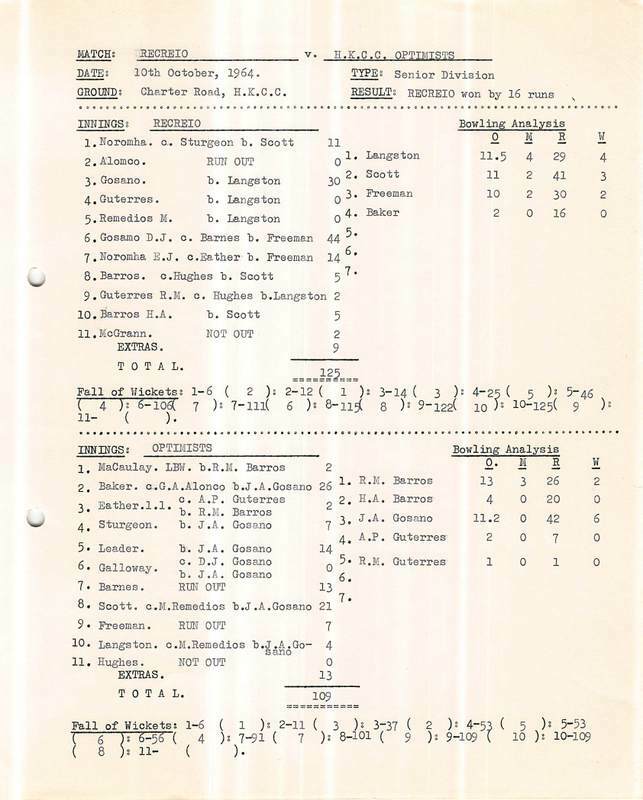 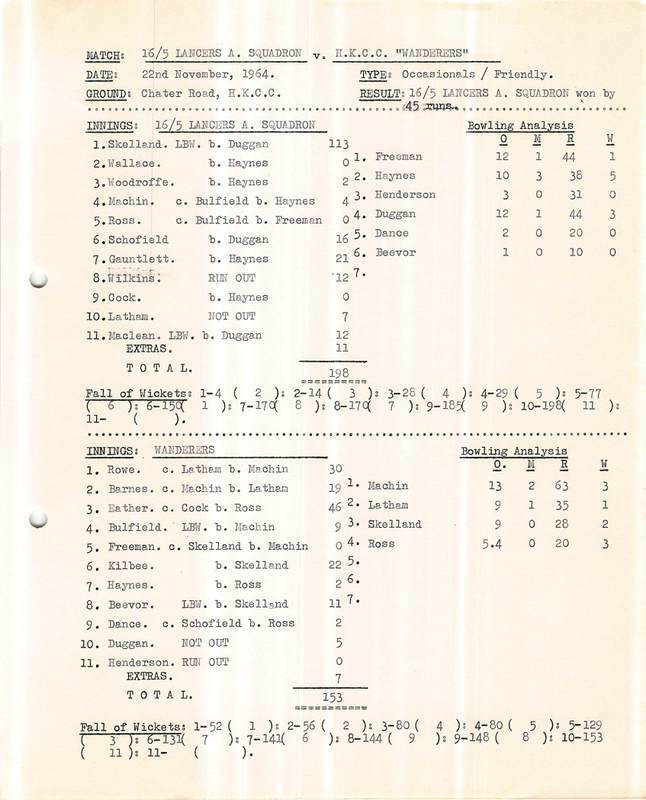 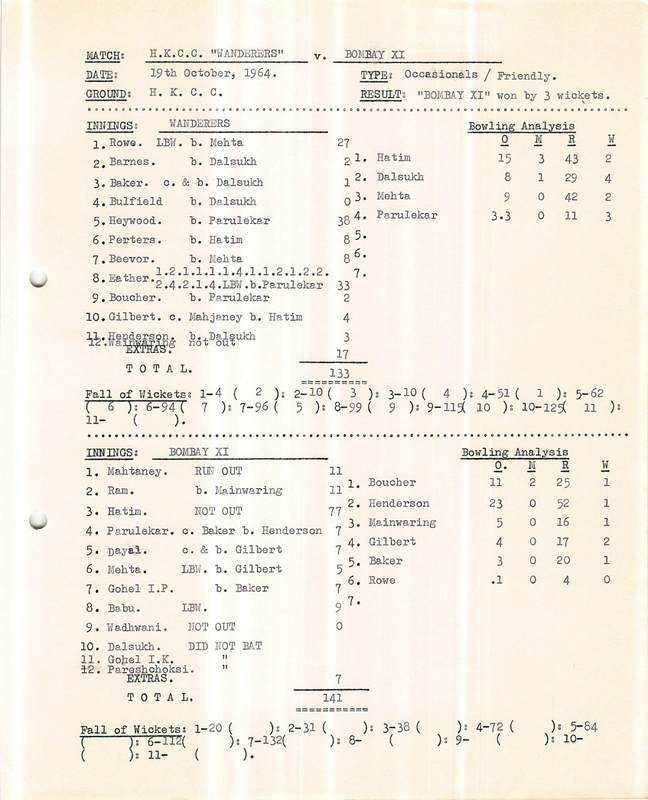 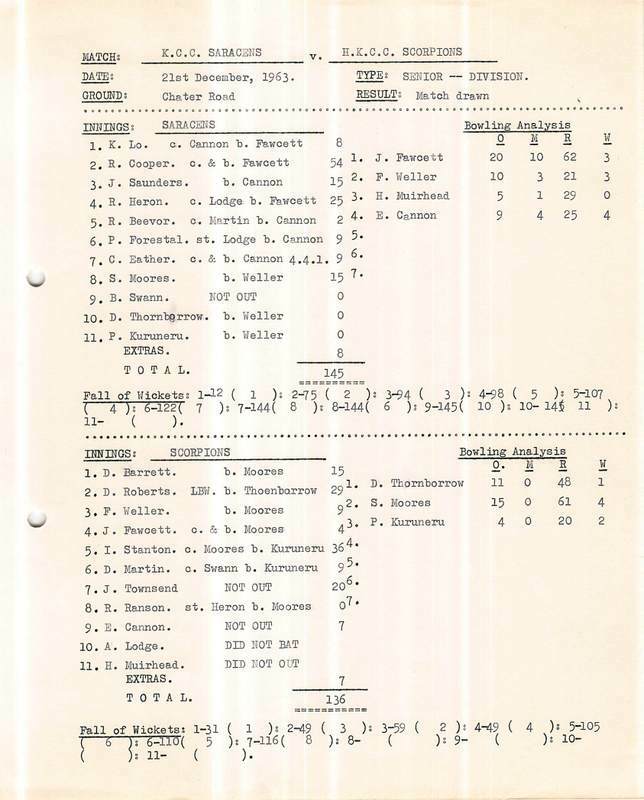 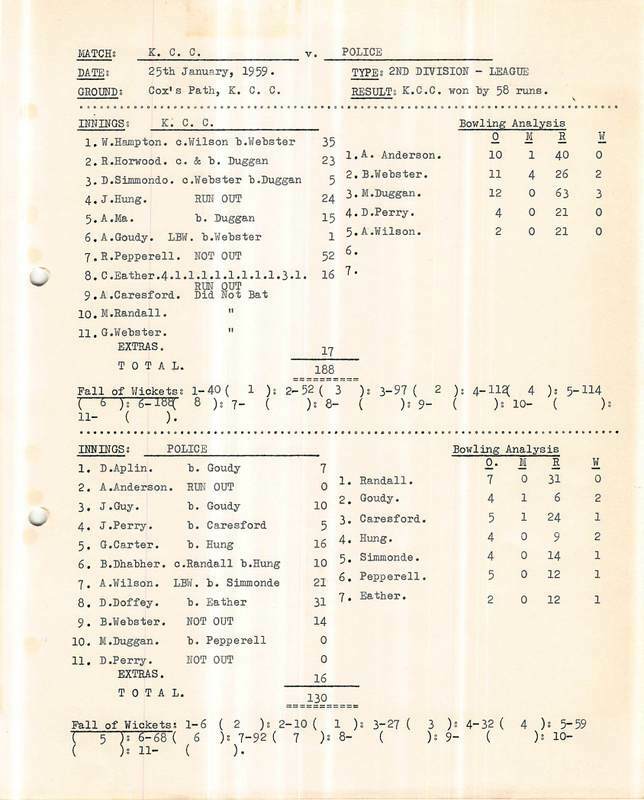 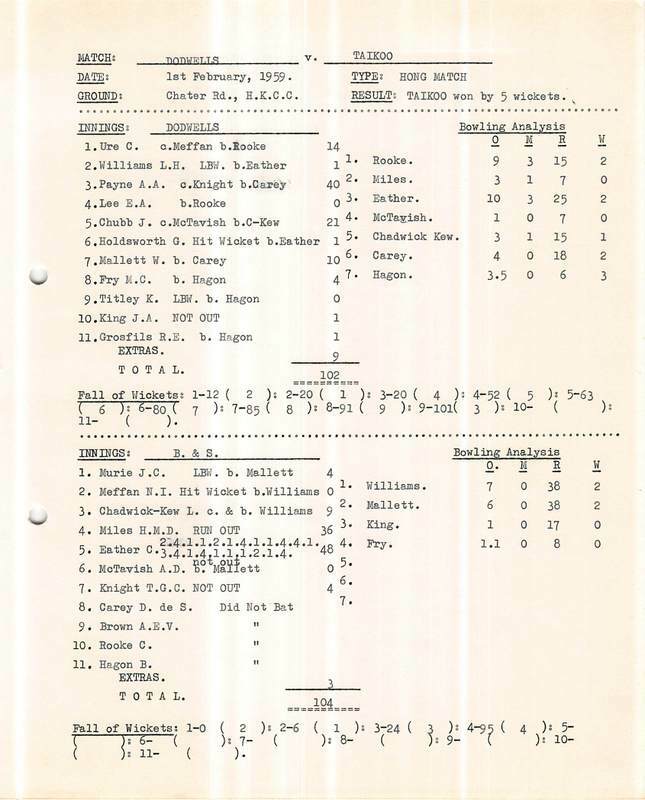 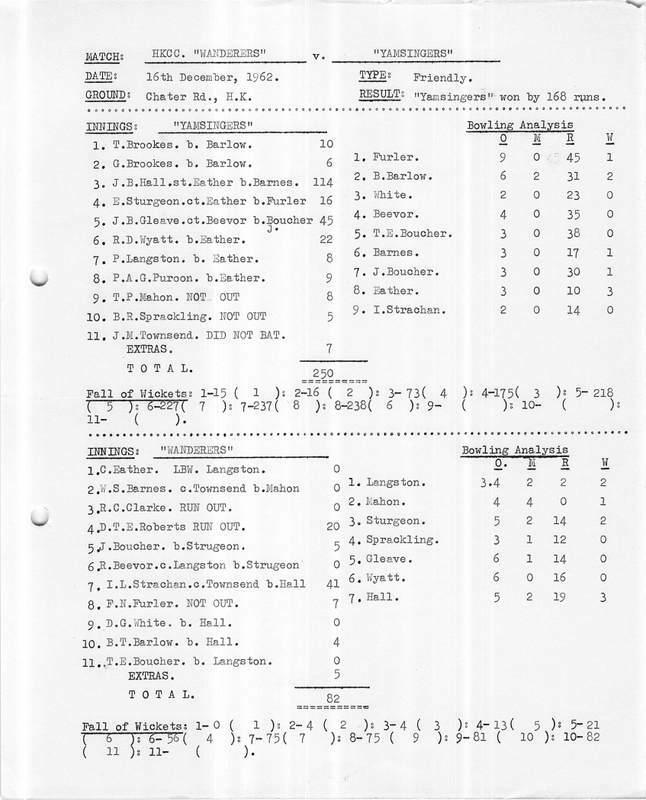 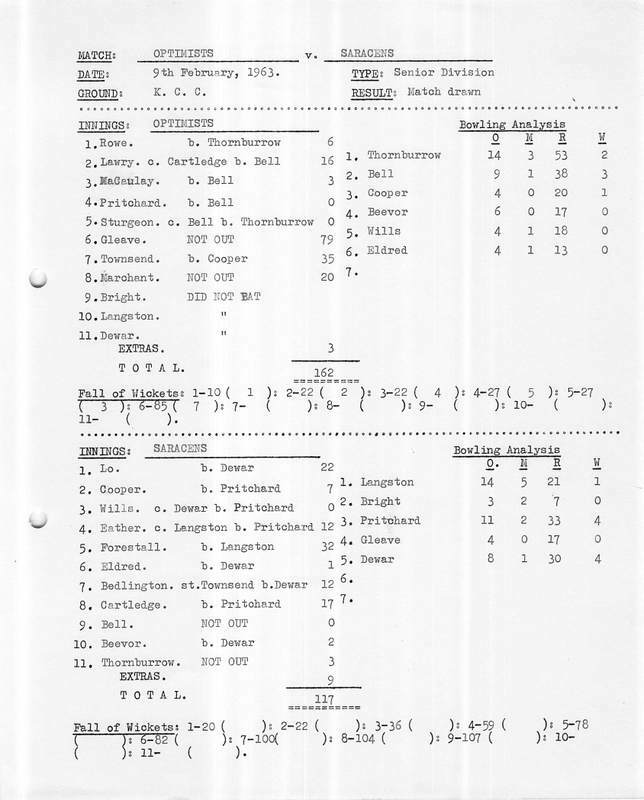 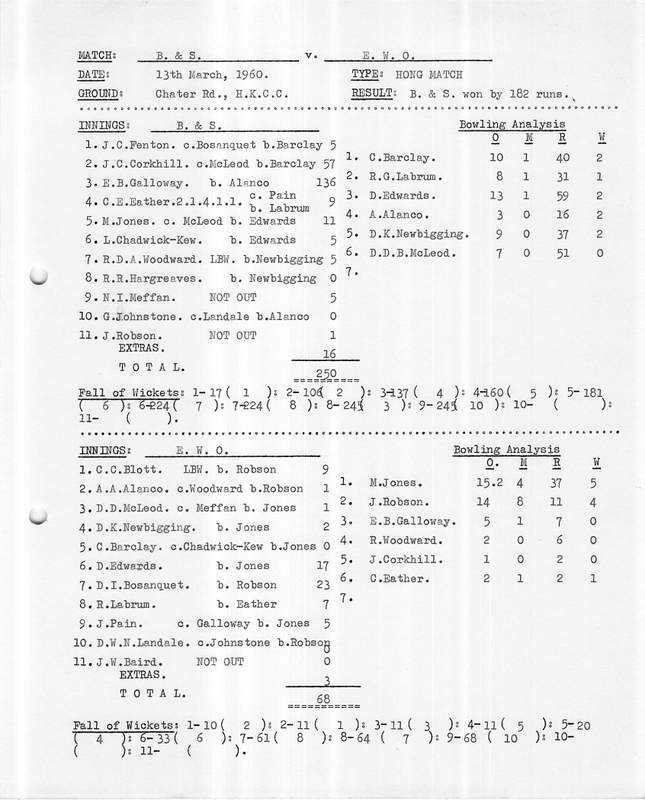 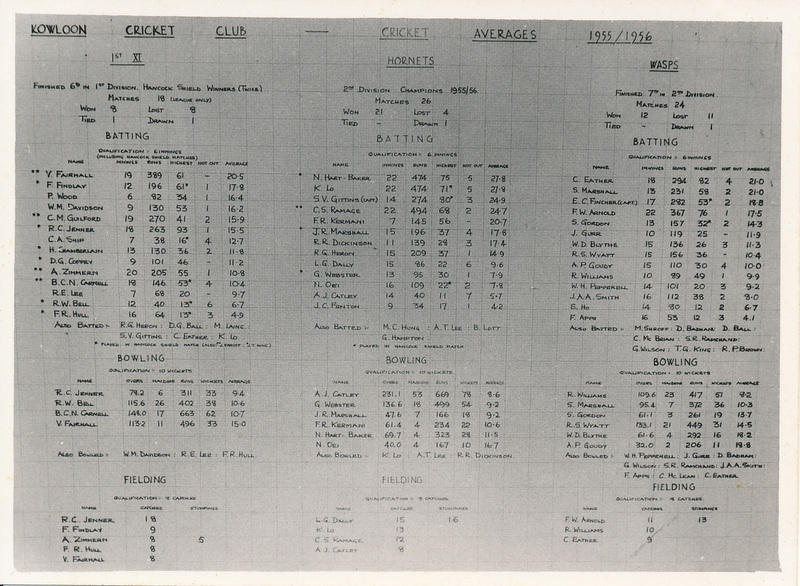 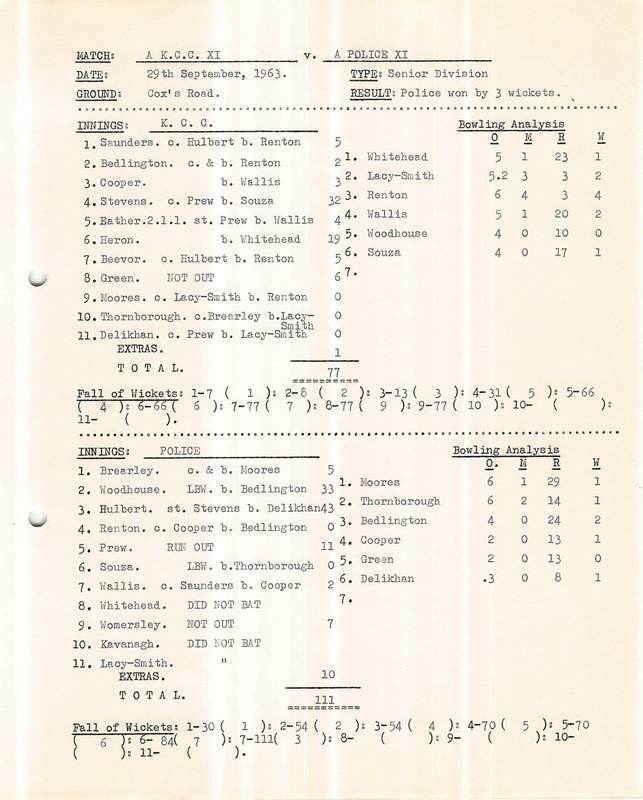 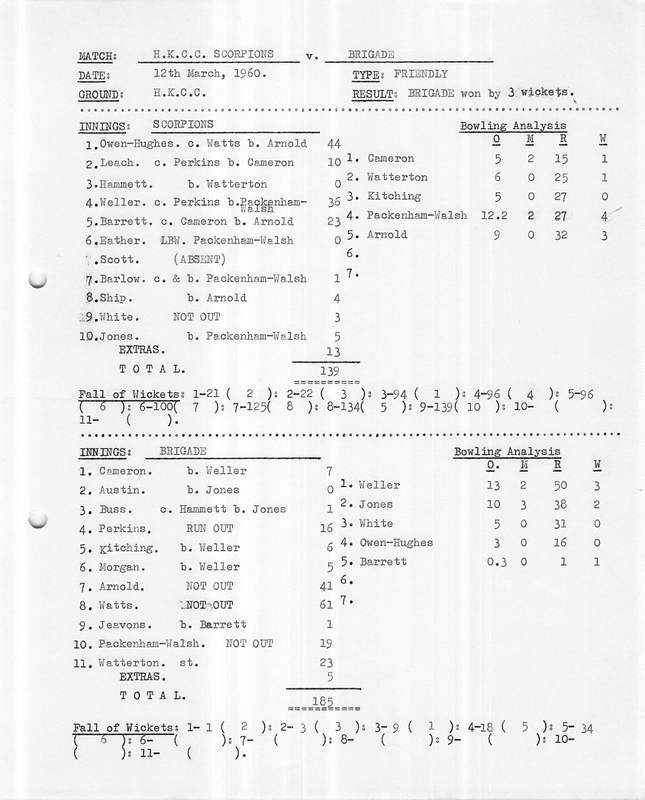 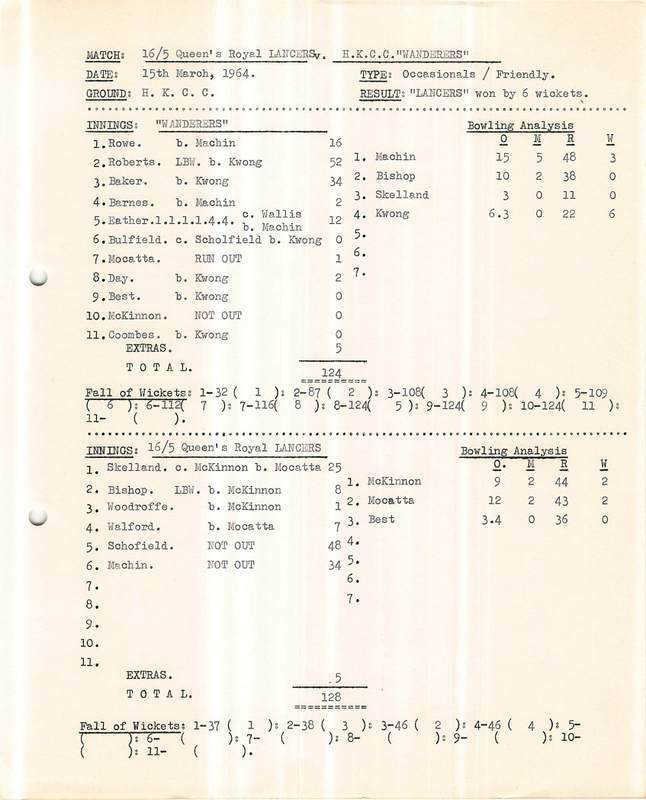 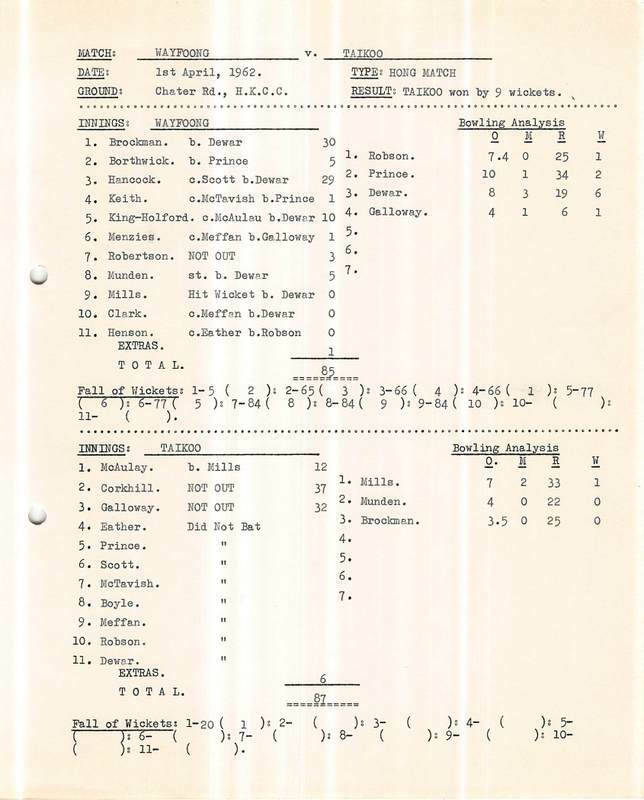 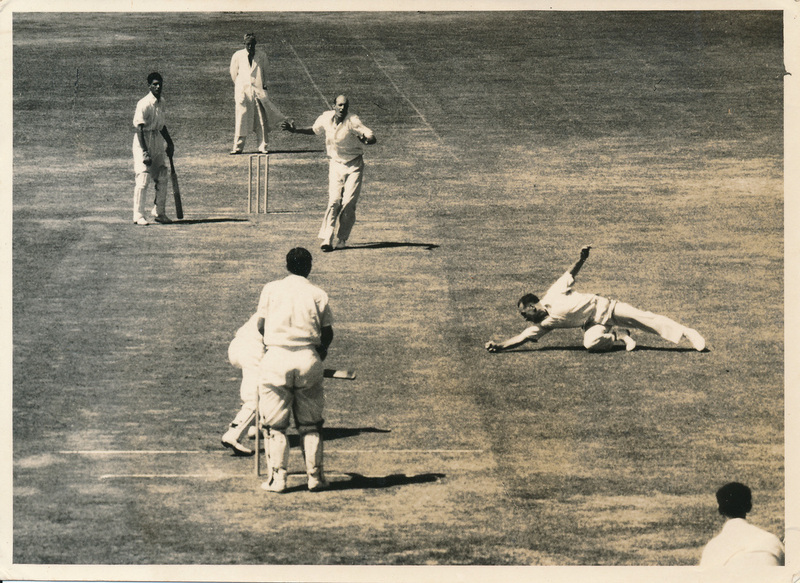 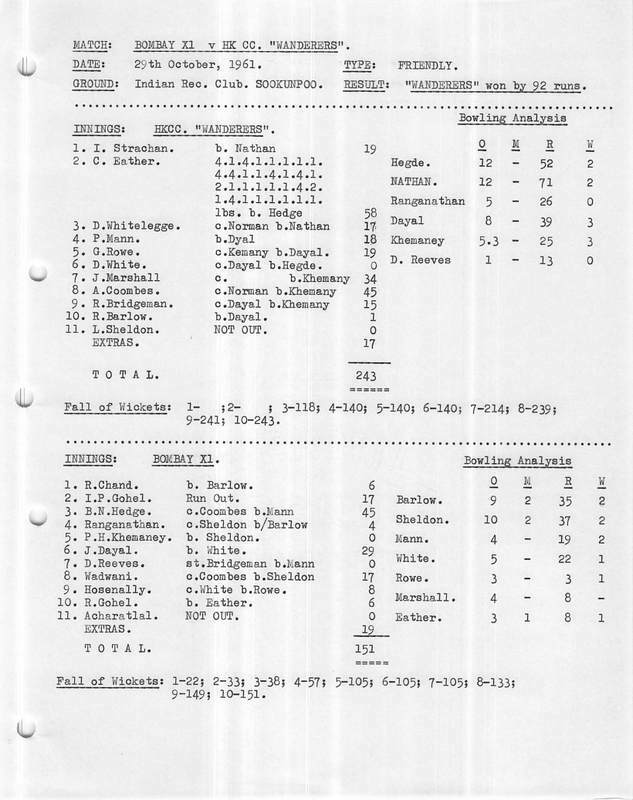 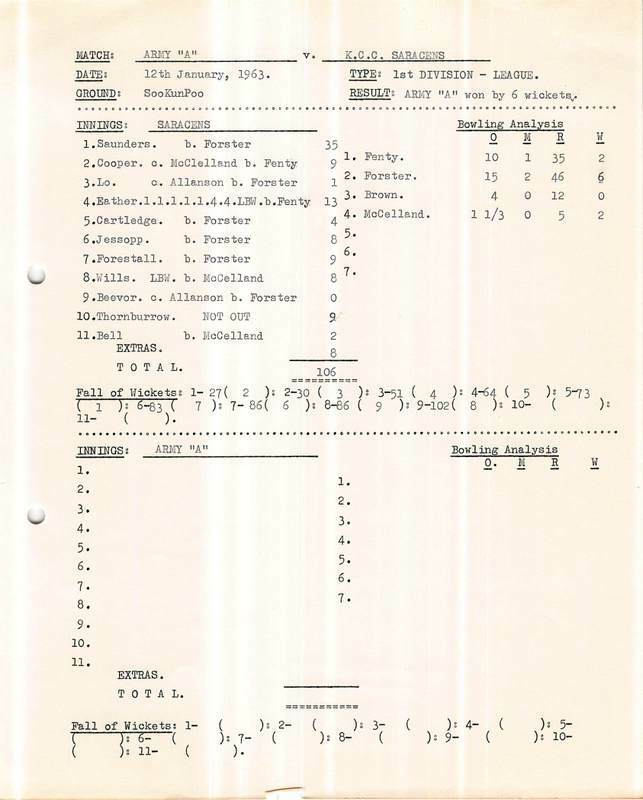 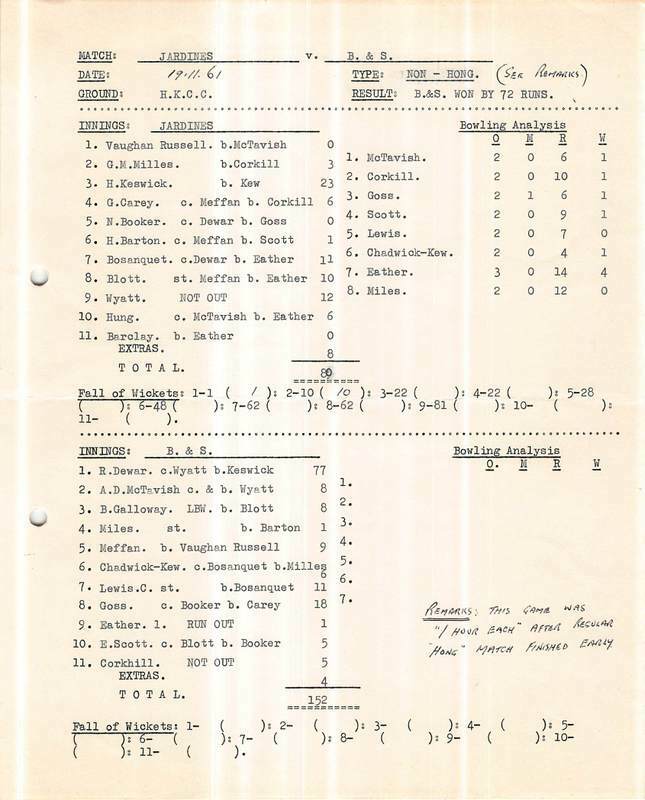 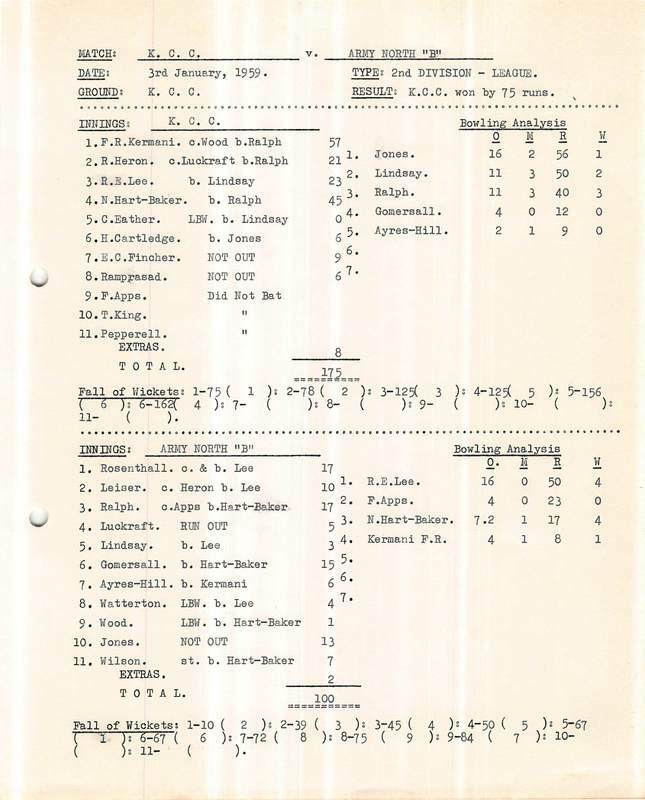 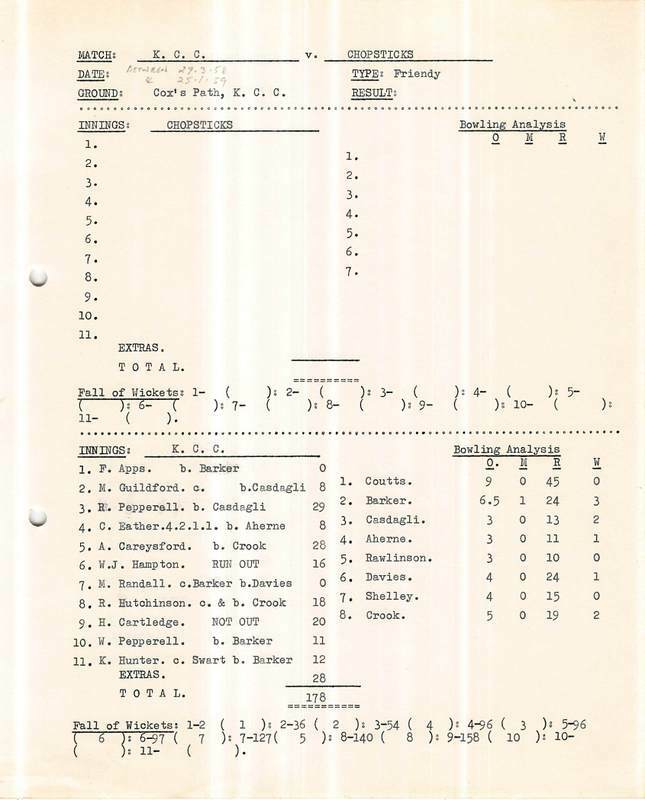 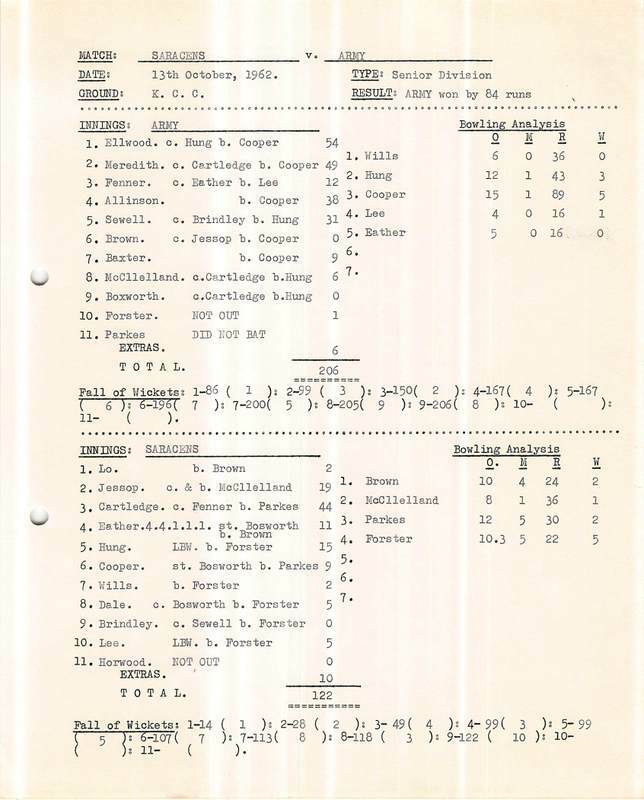 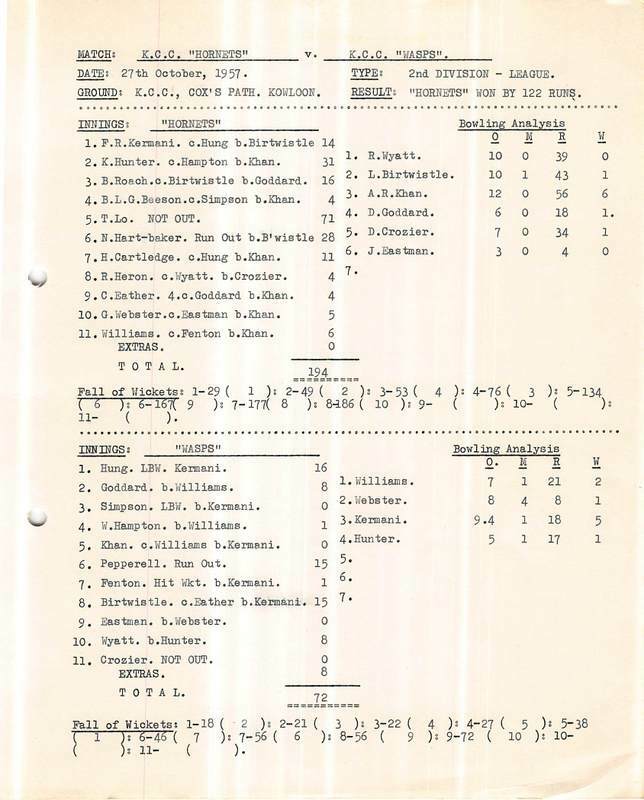 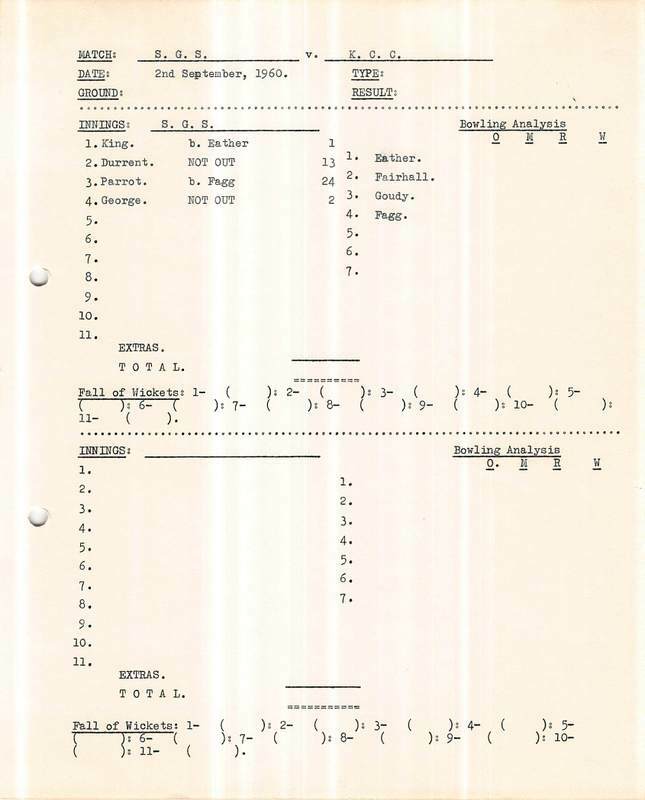 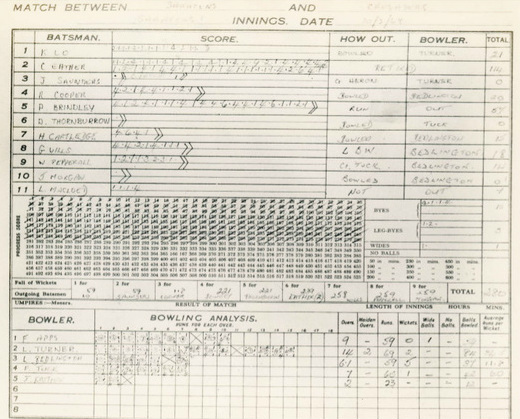 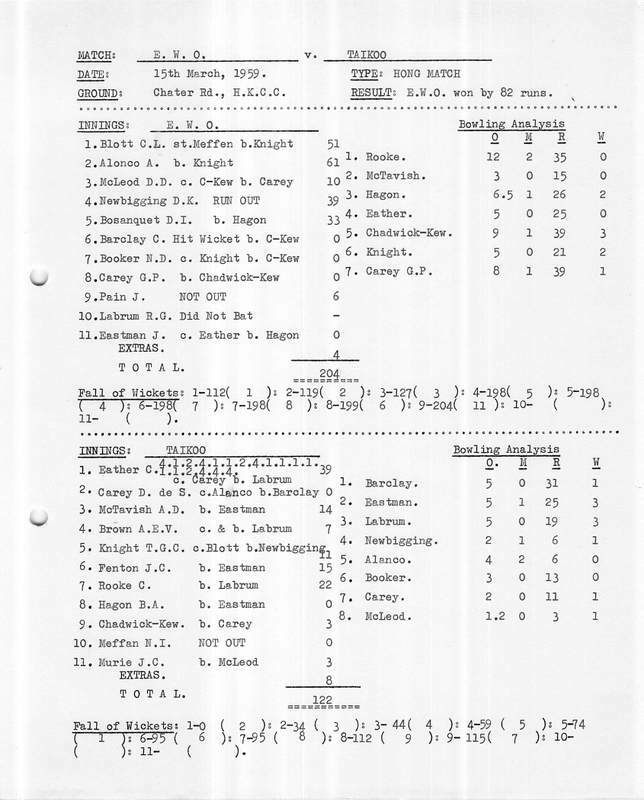 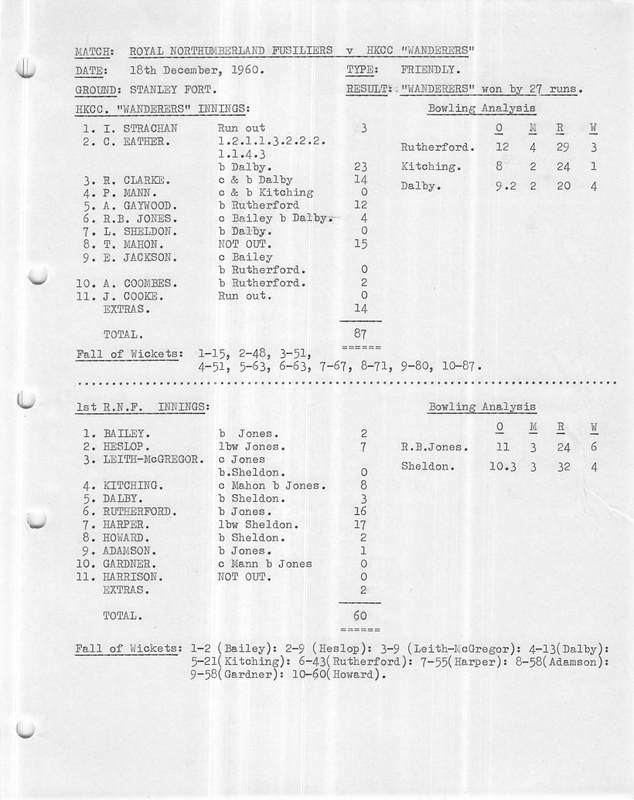 Above and Right: CPA/B&S/HAECO vs Royal Observatory Sunday 20.3.1955. 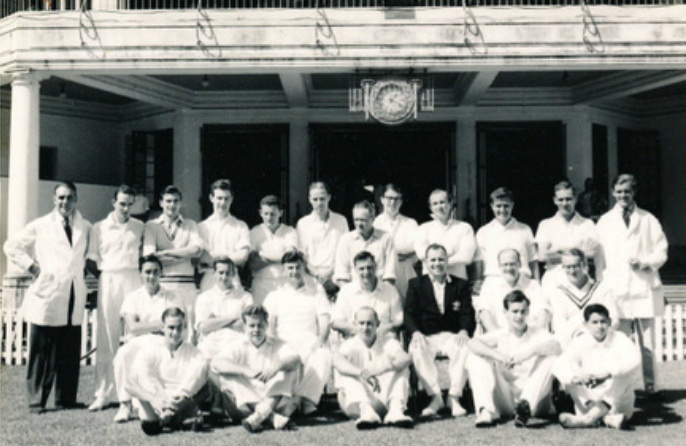 Colin Ramage Captain Royal Observatory. 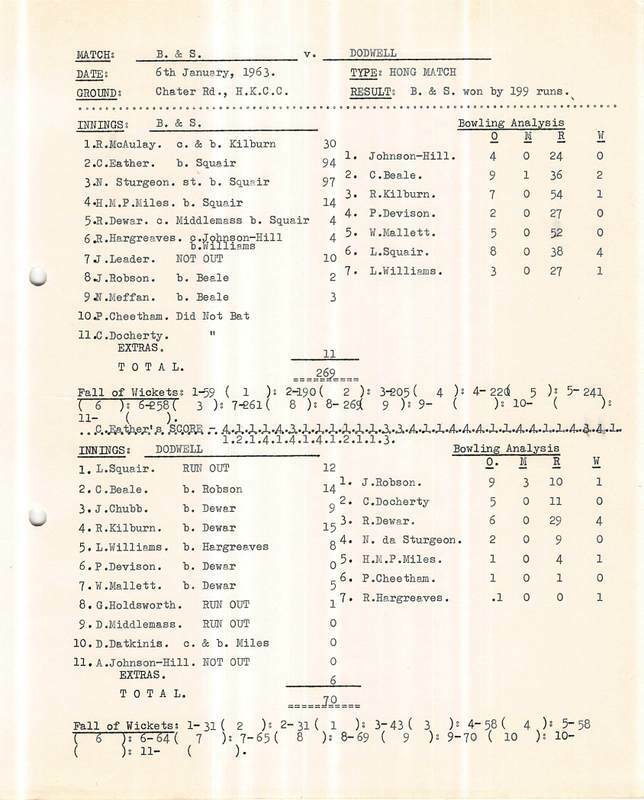 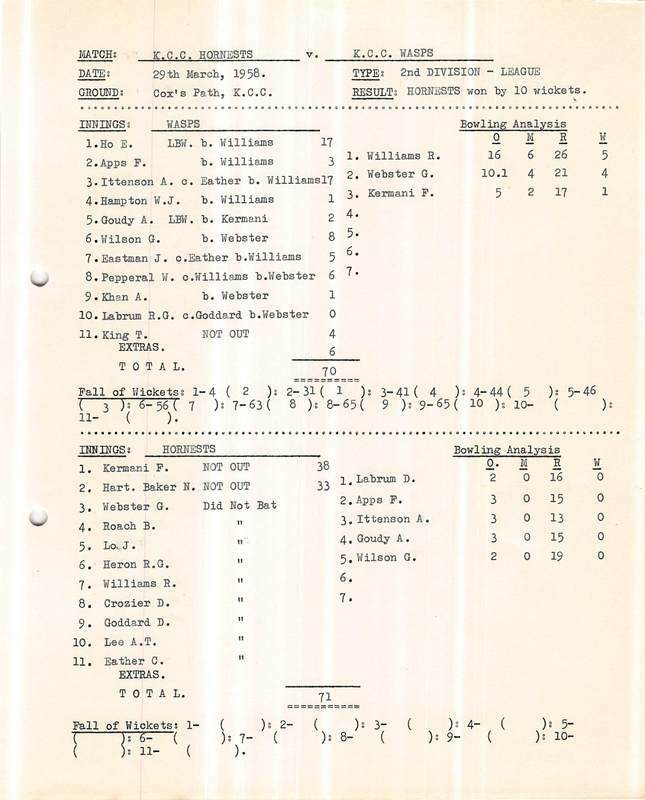 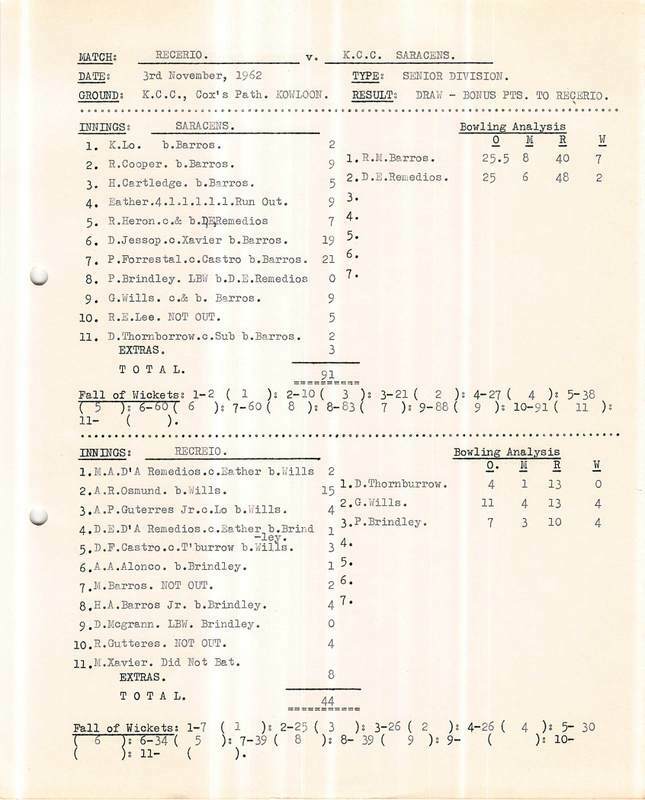 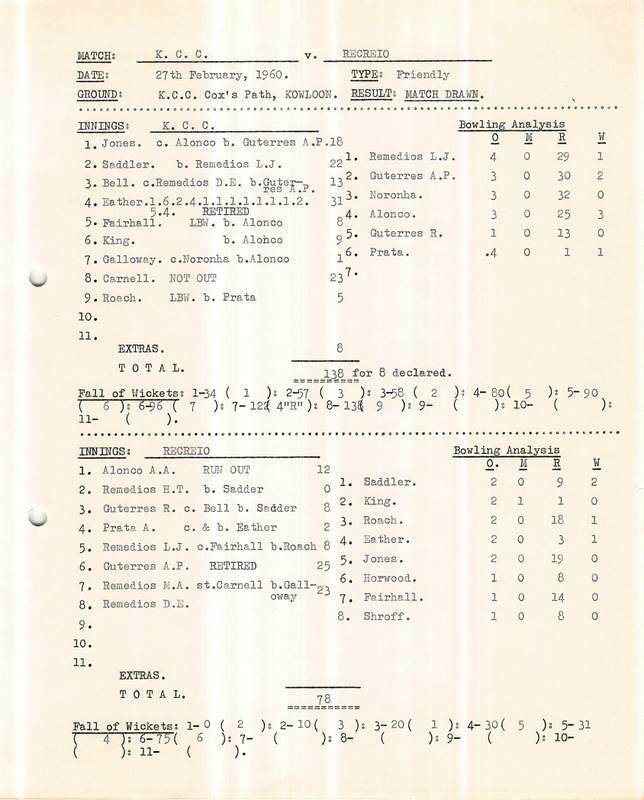 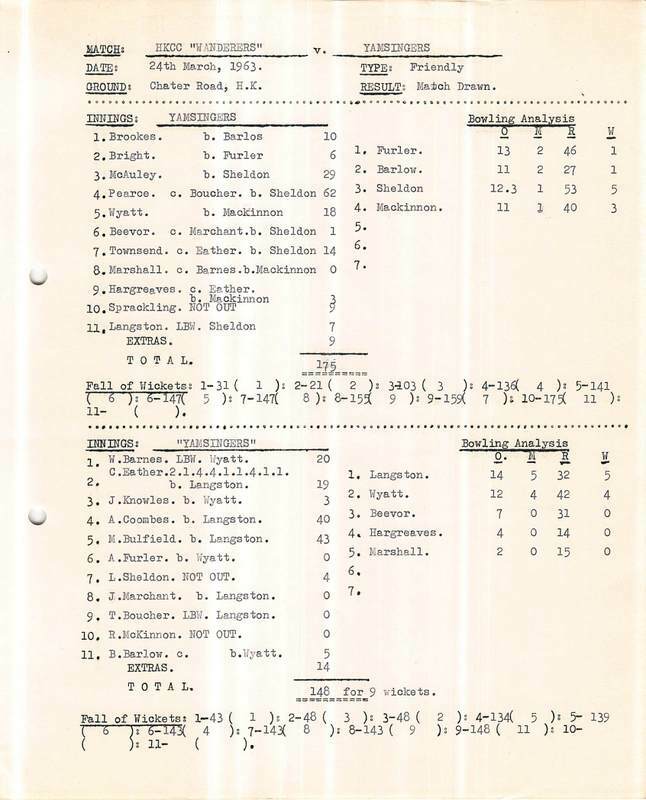 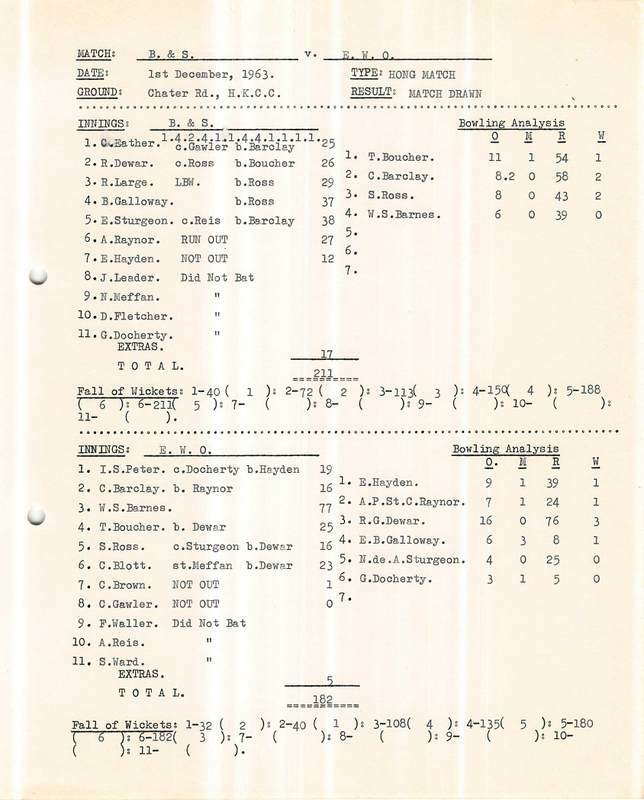 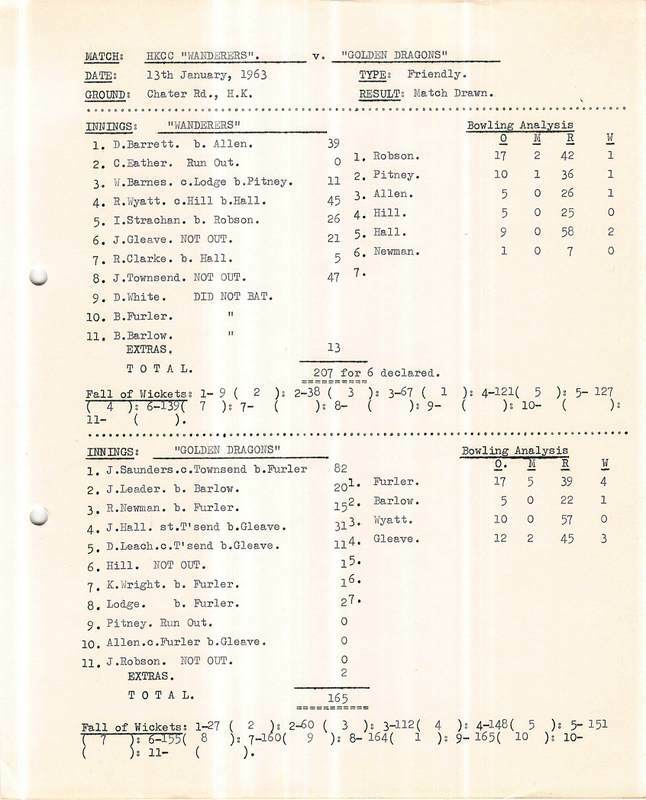 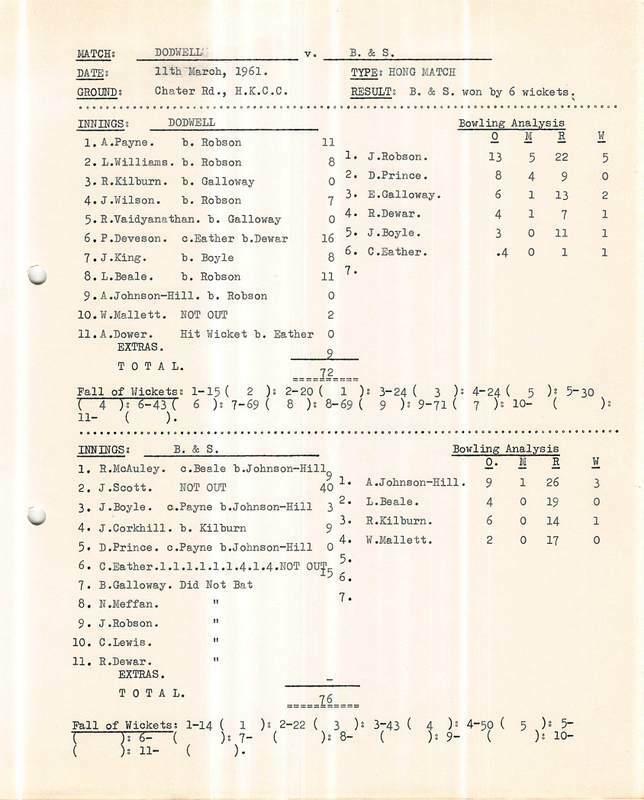 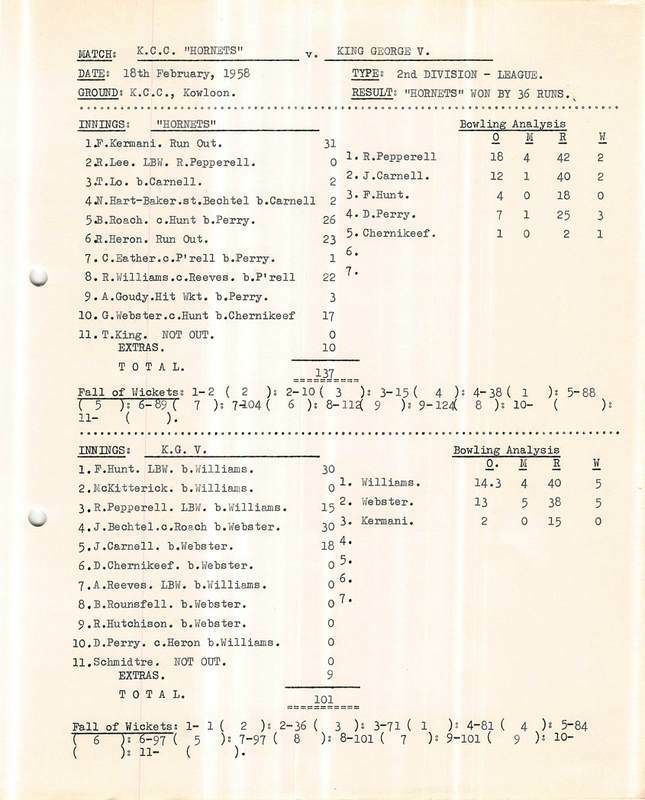 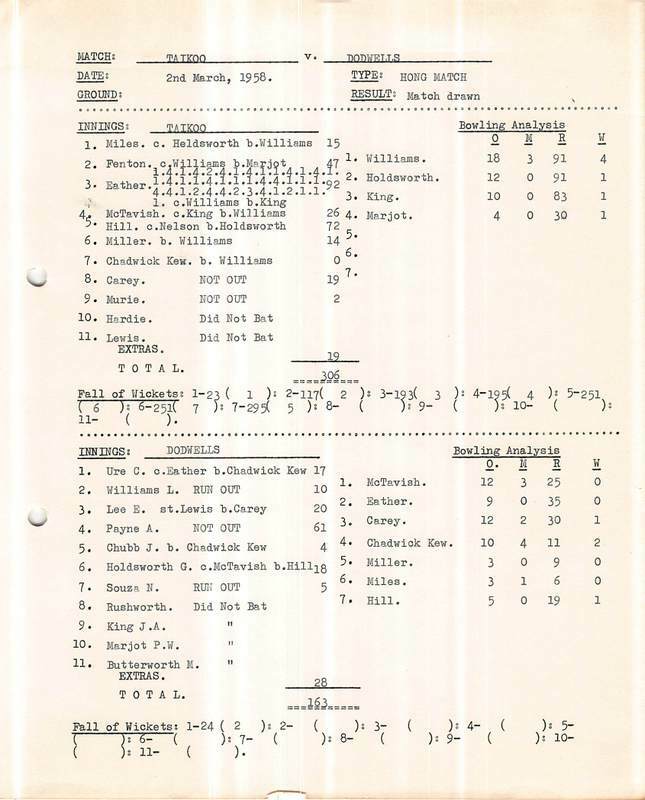 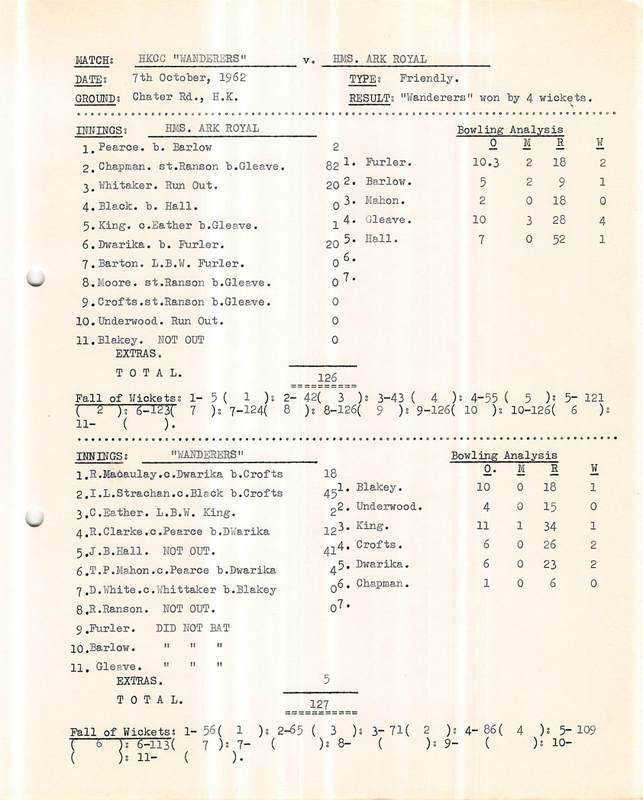 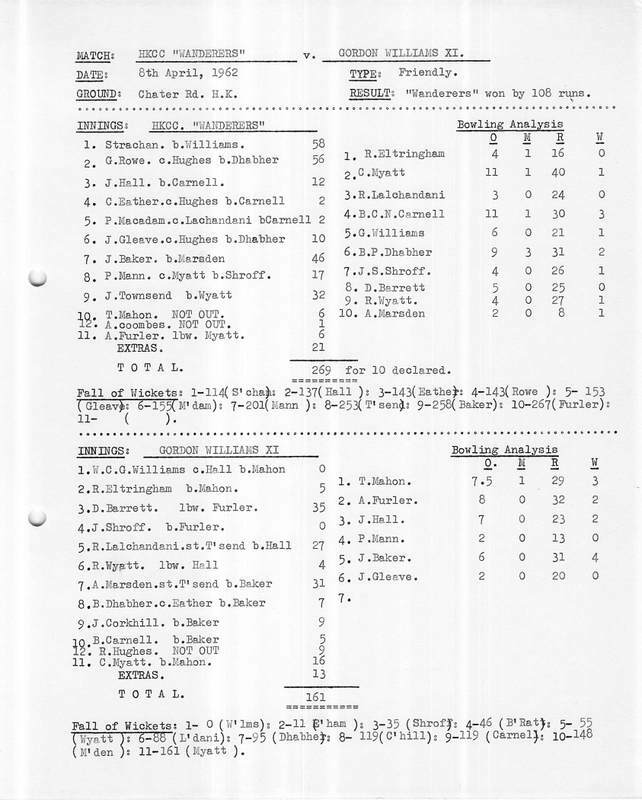 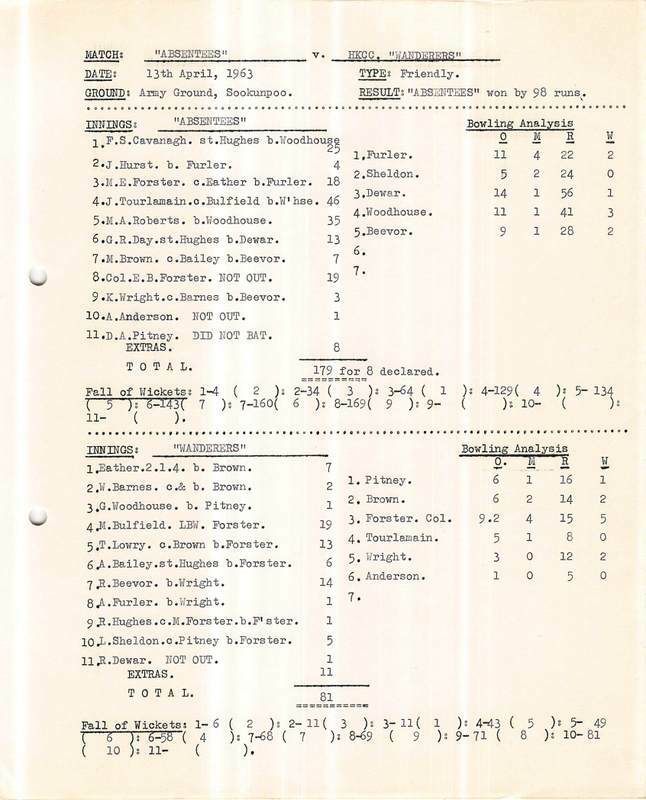 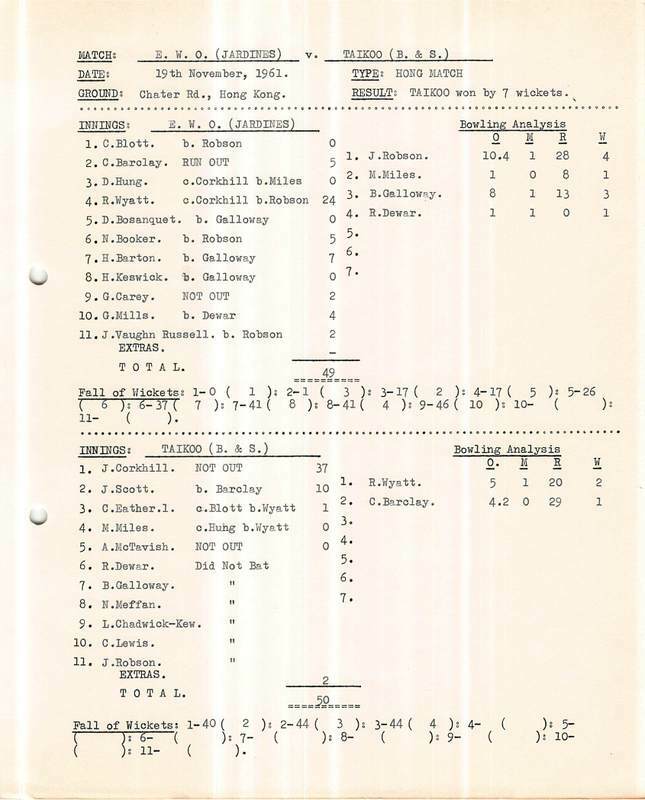 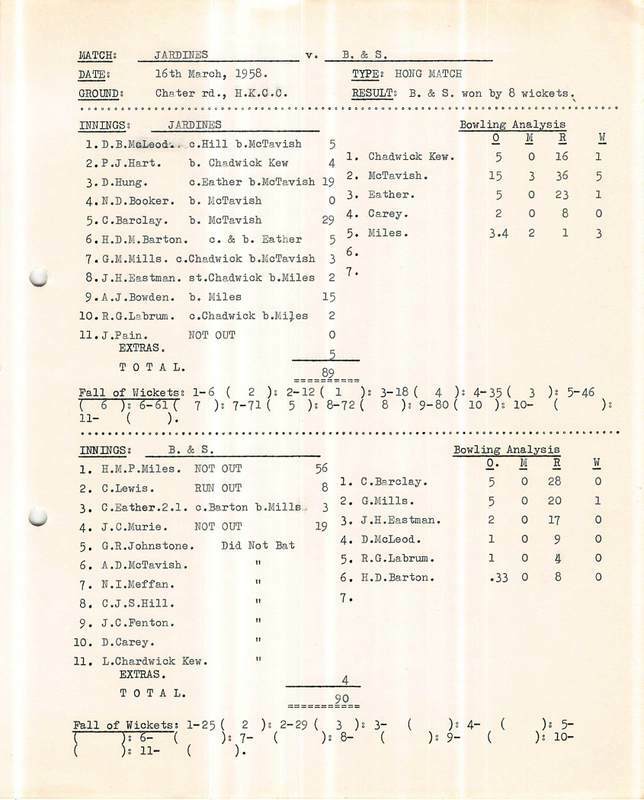 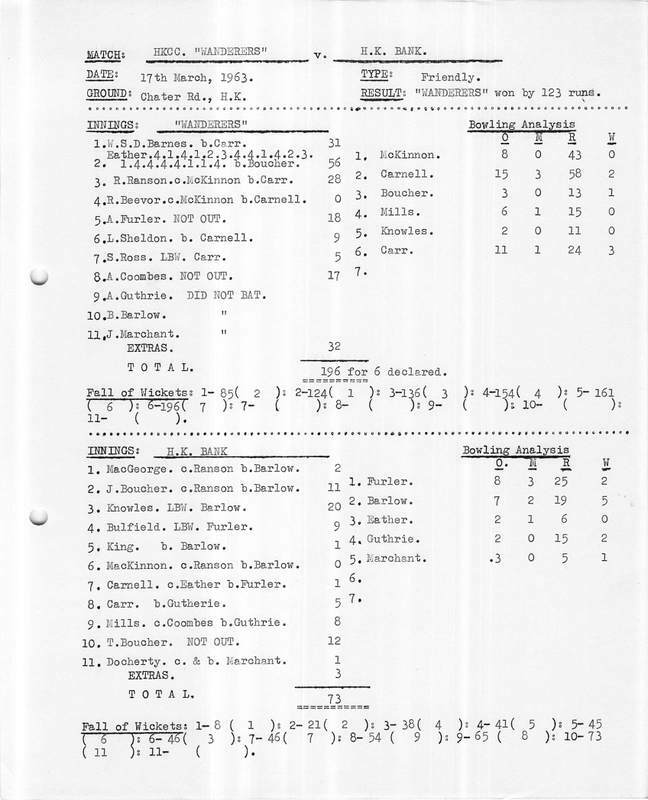 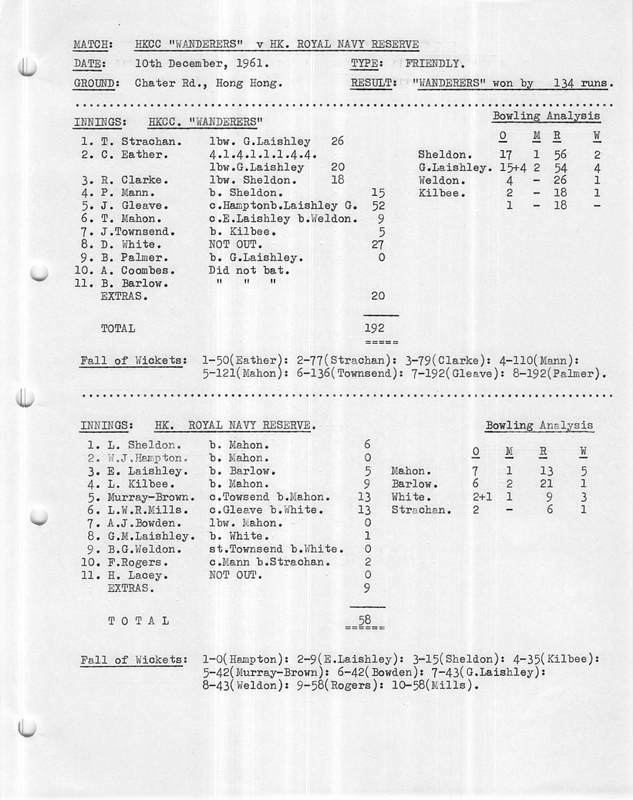 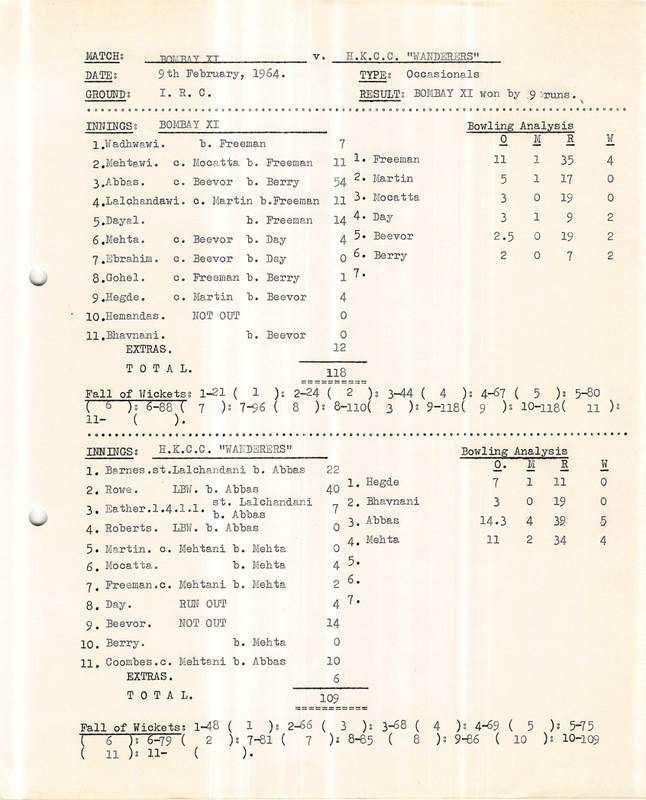 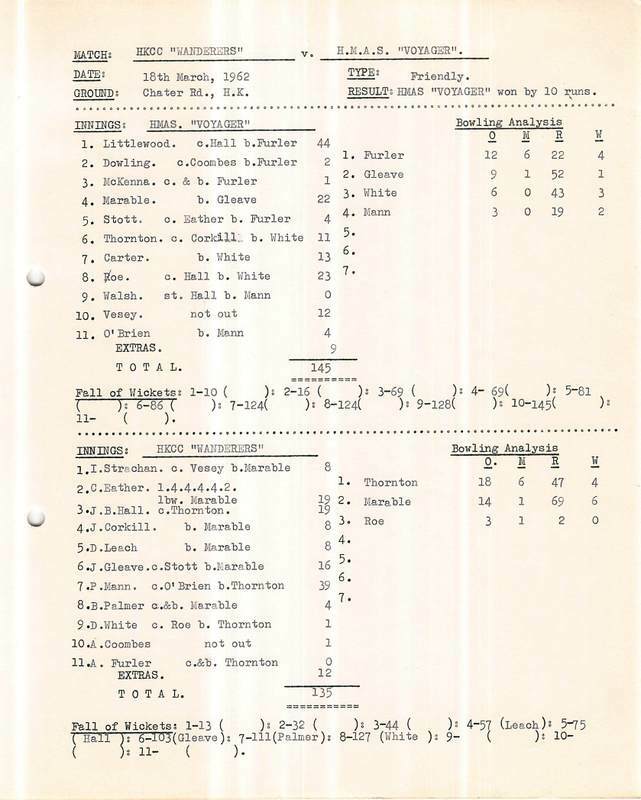 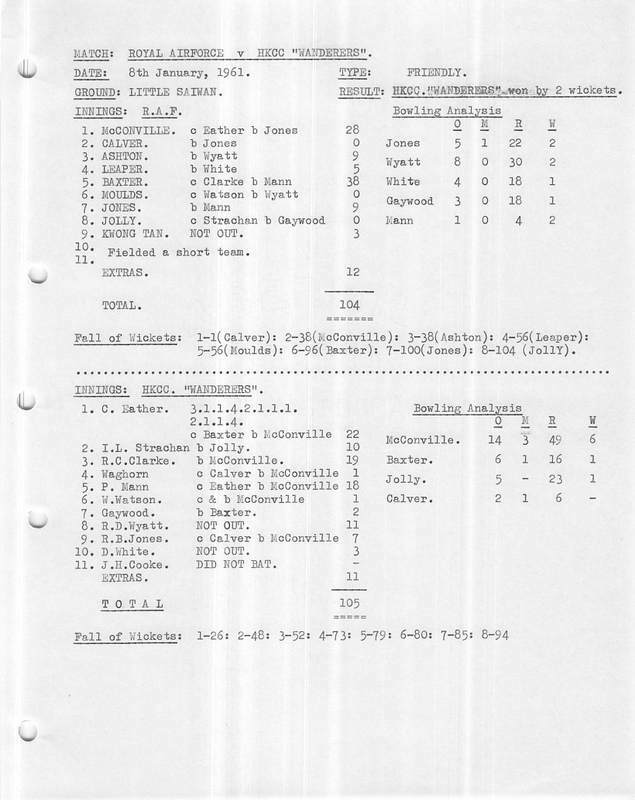 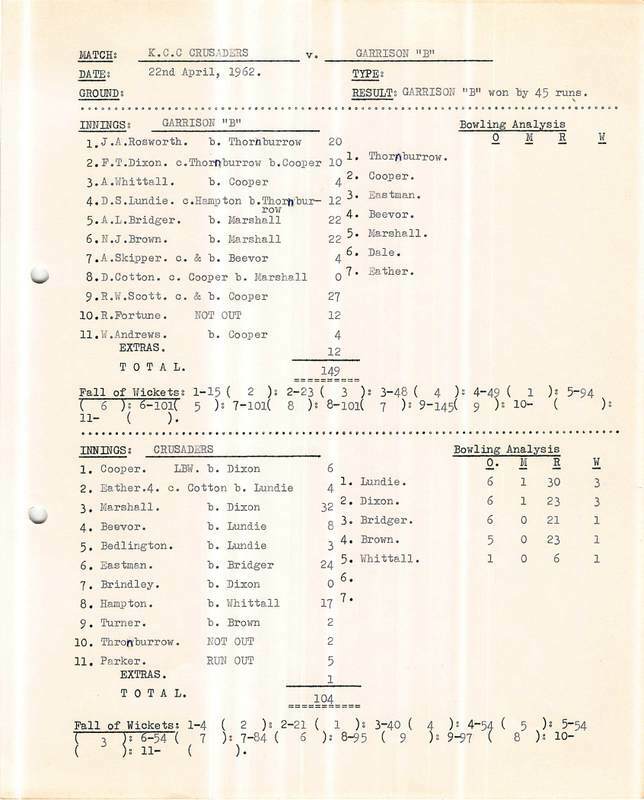 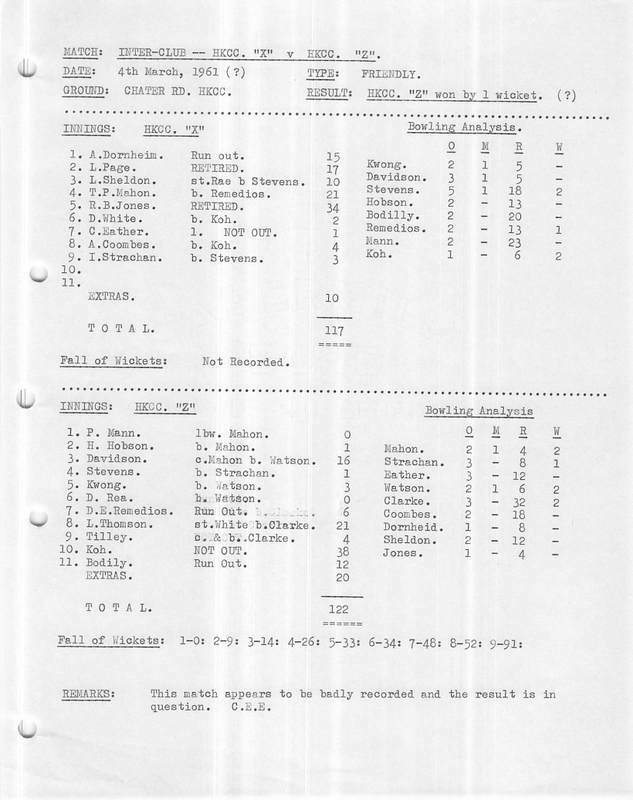 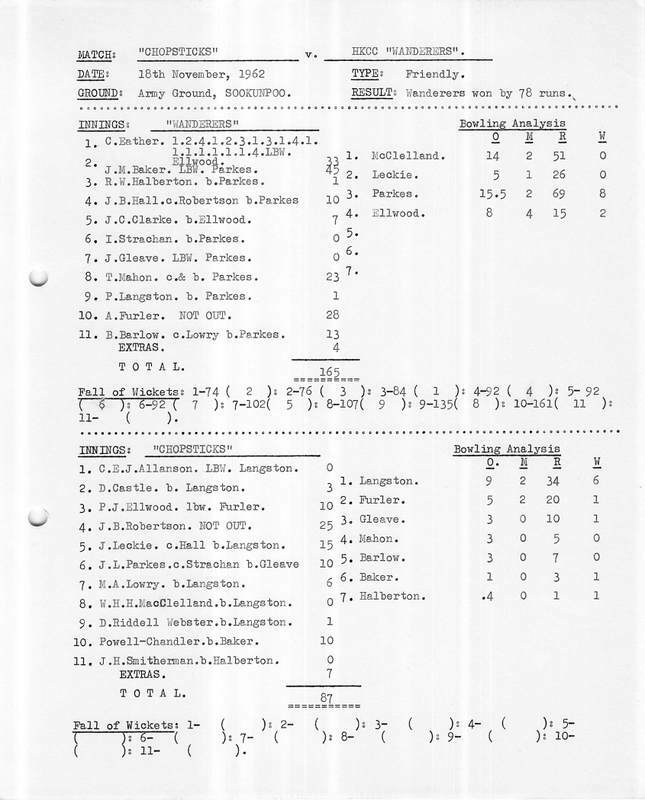 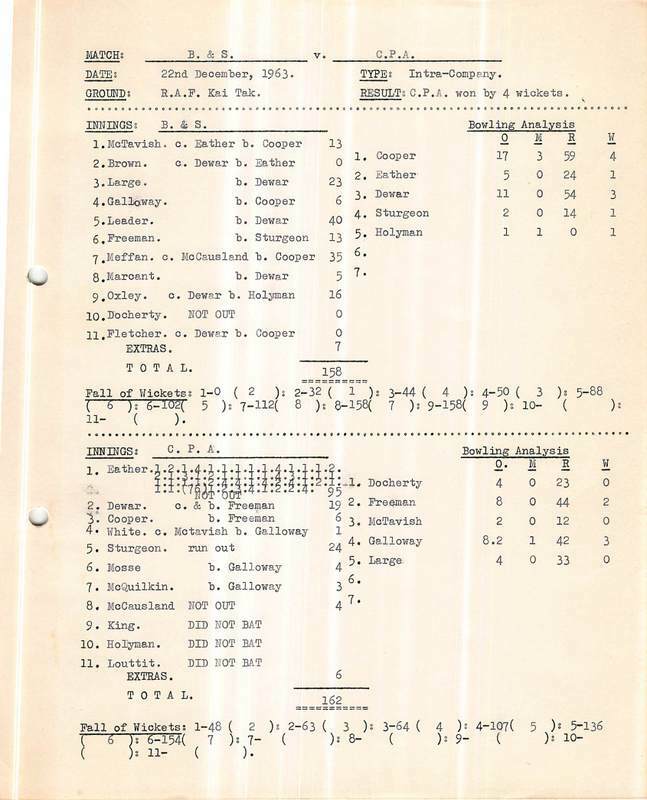 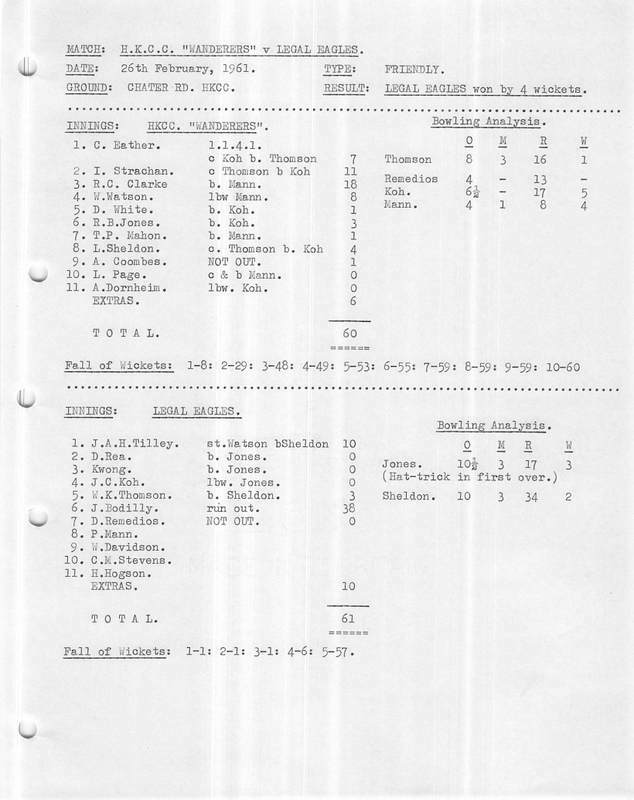 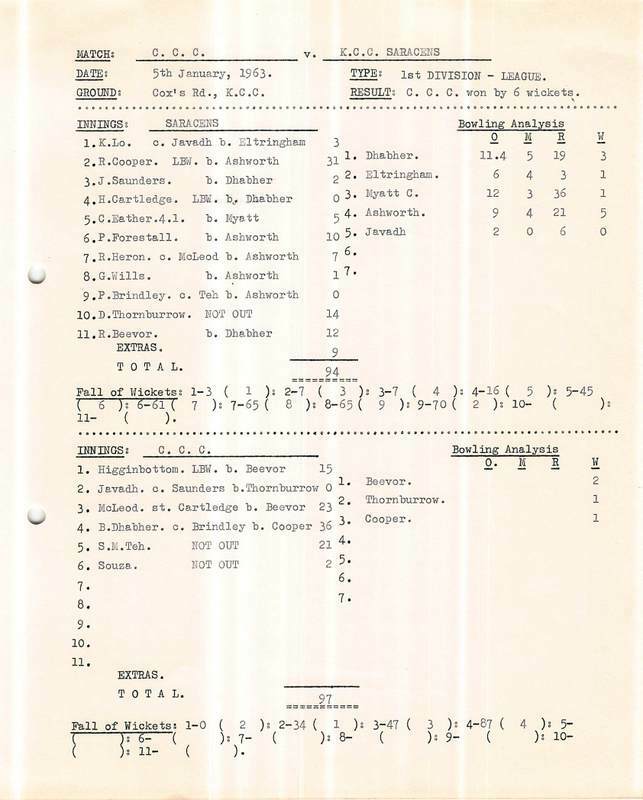 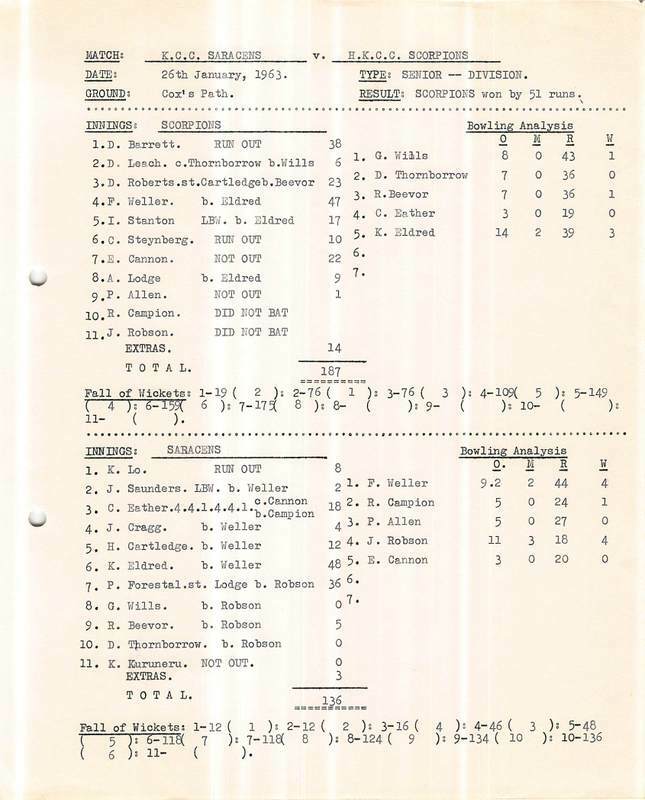 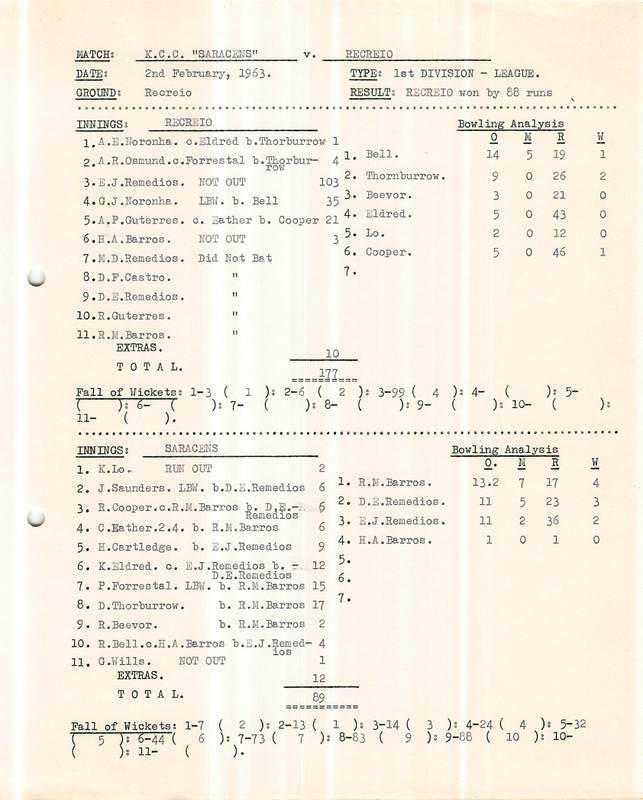 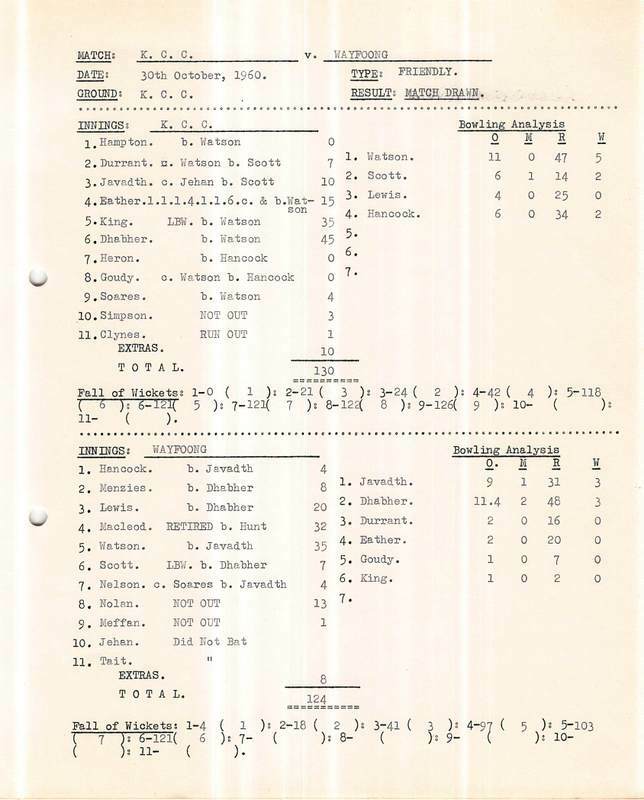 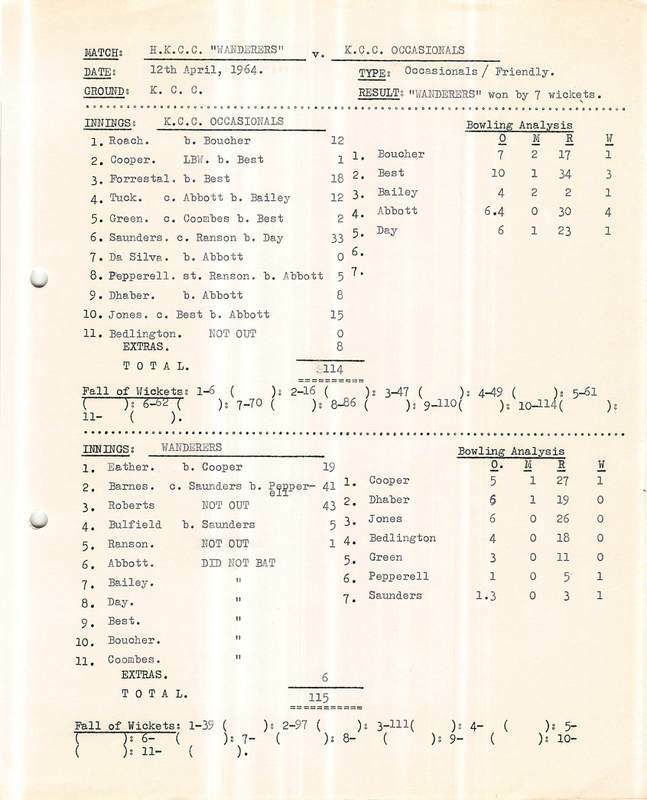 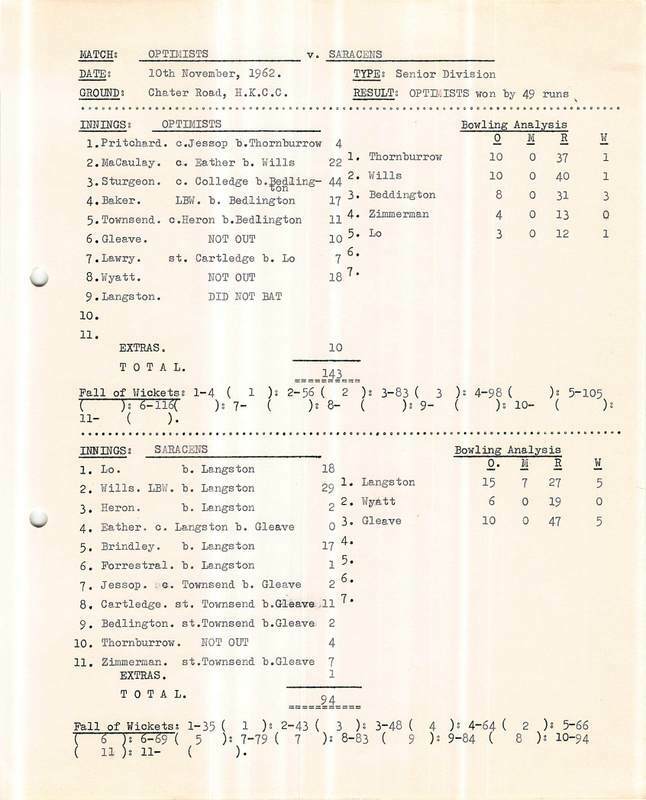 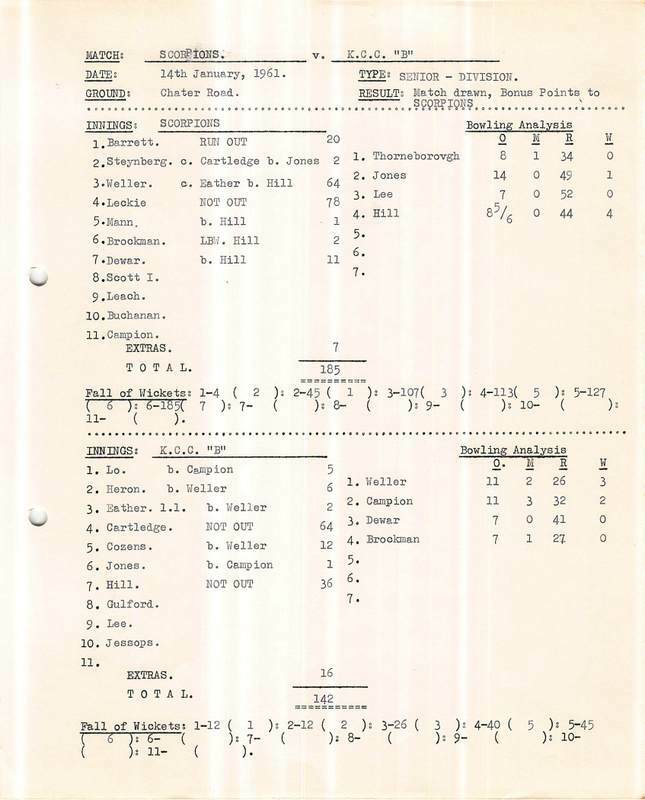 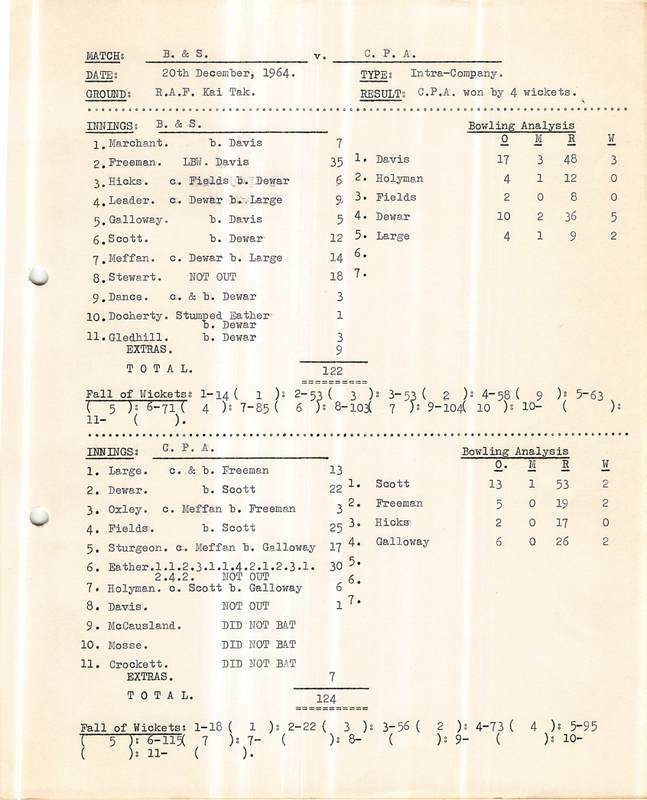 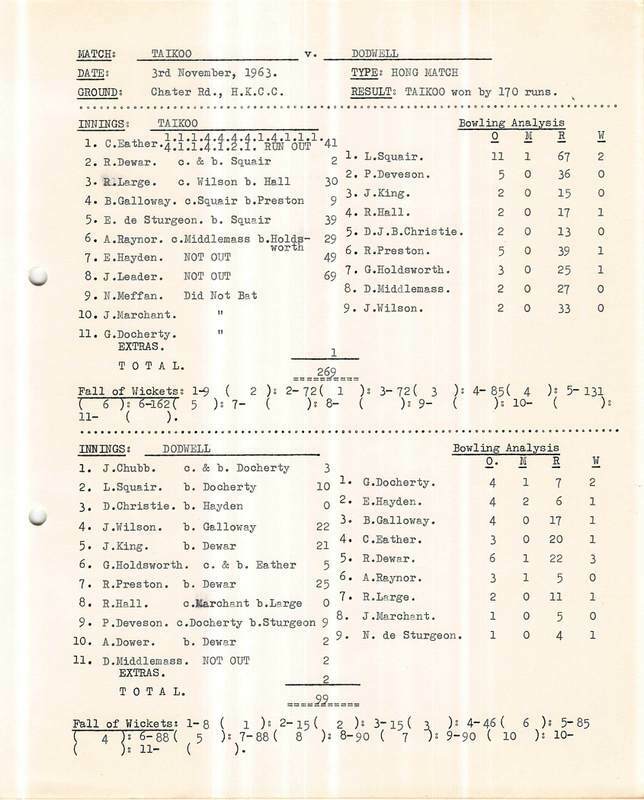 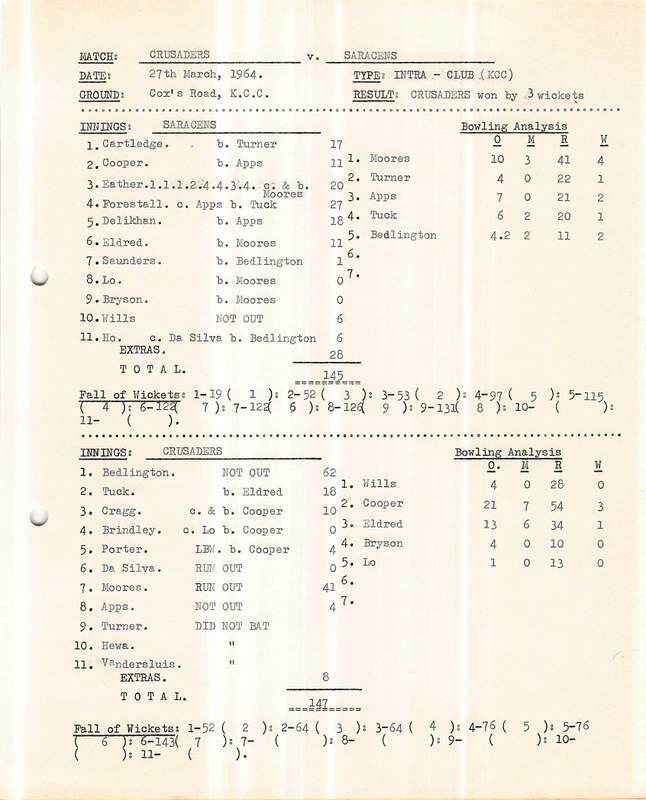 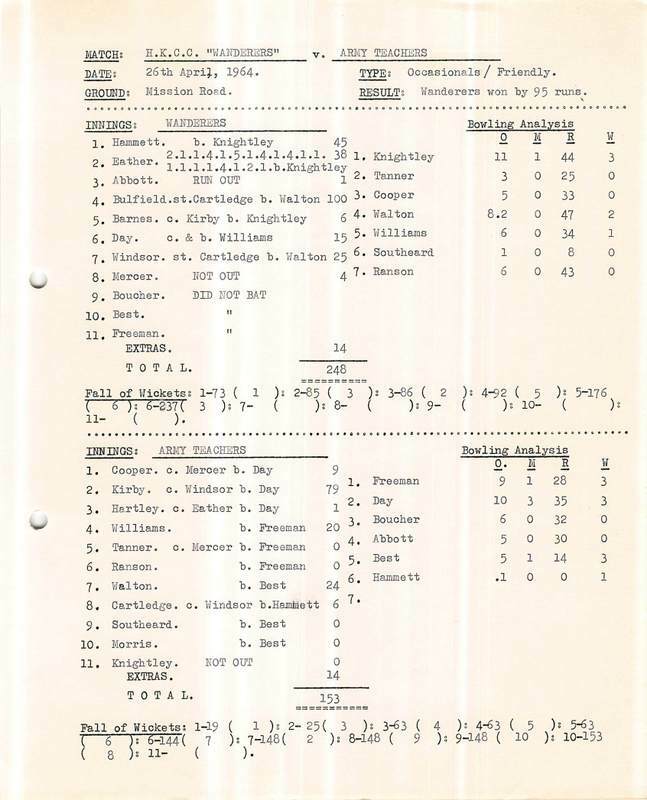 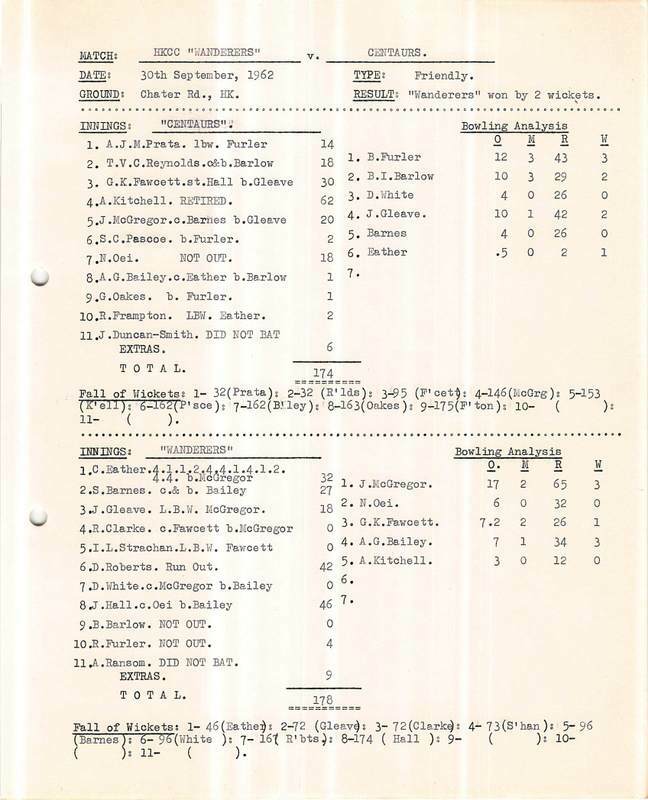 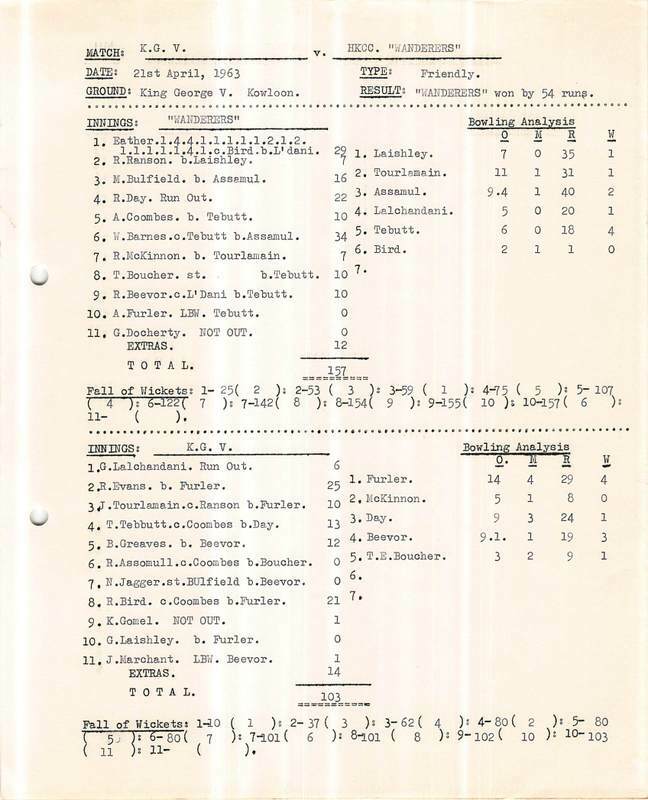 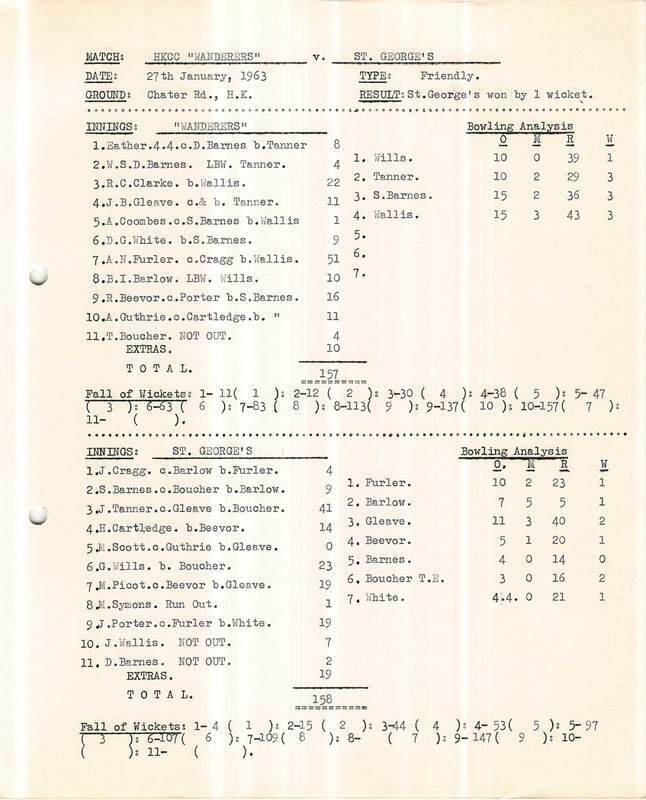 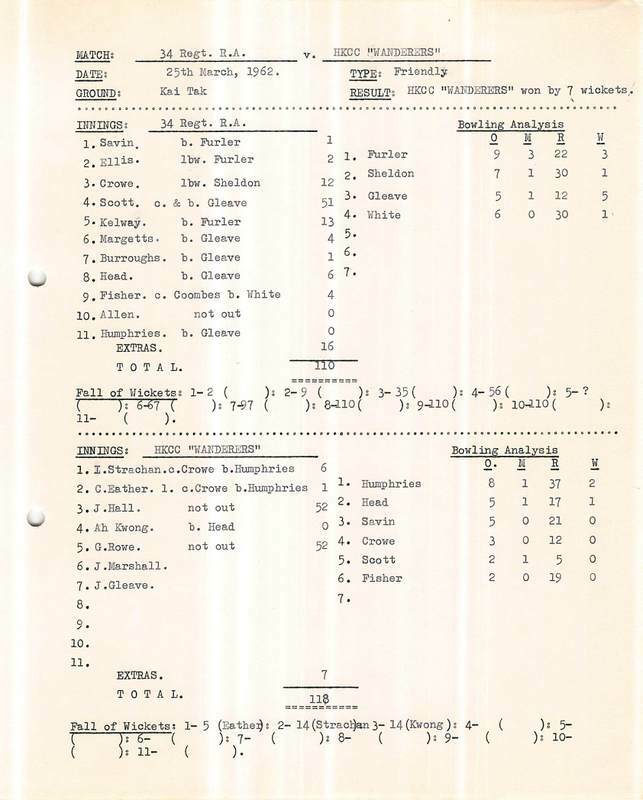 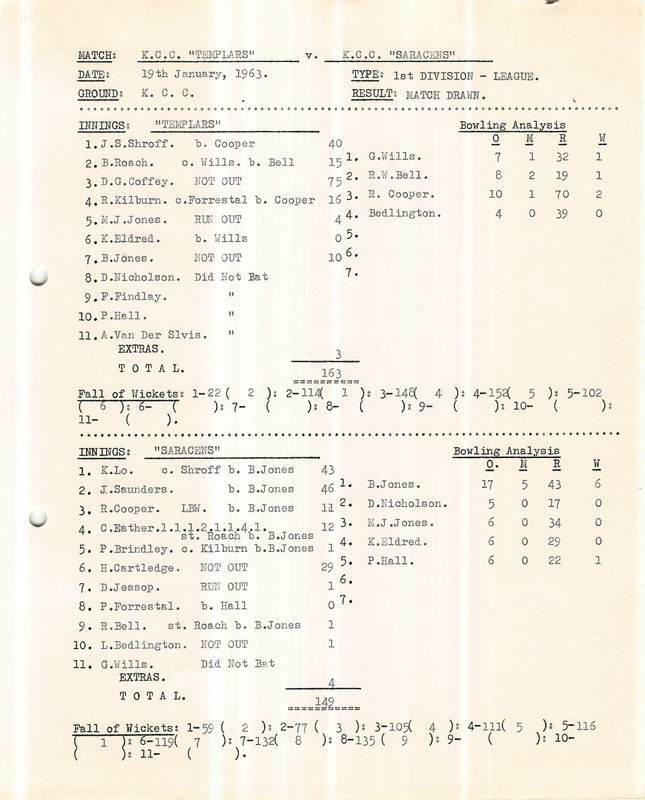 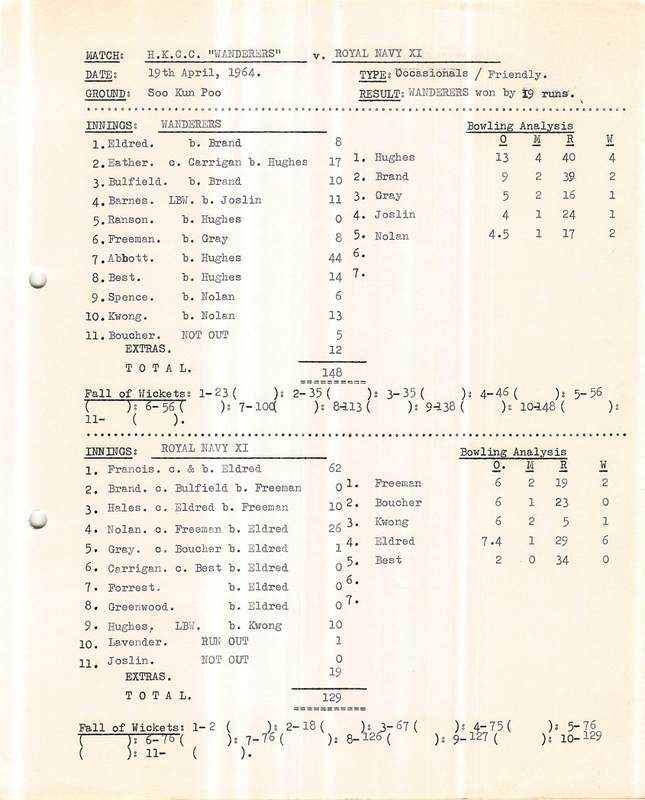 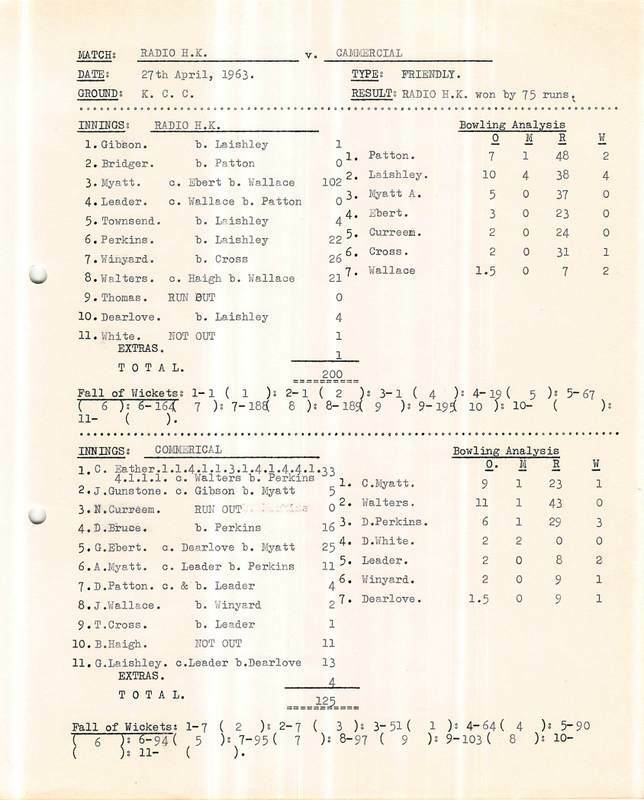 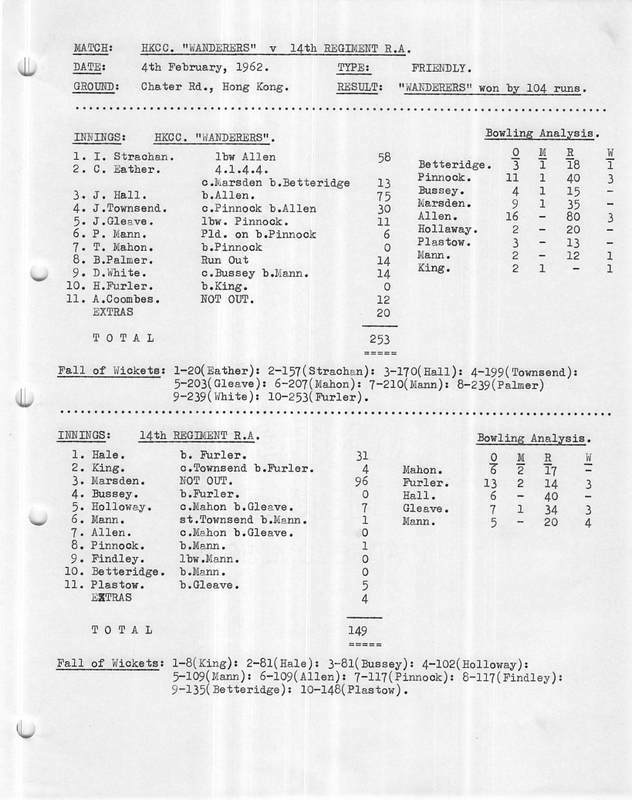 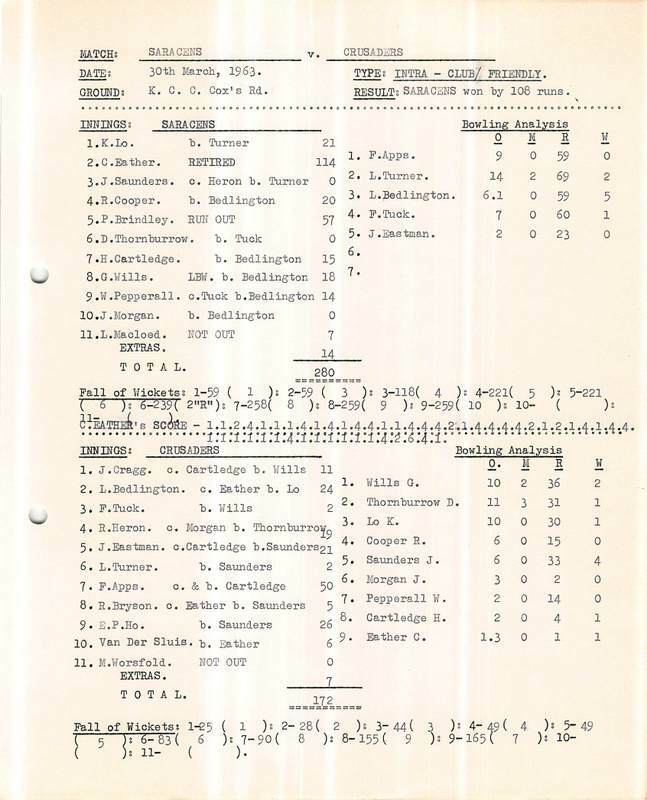 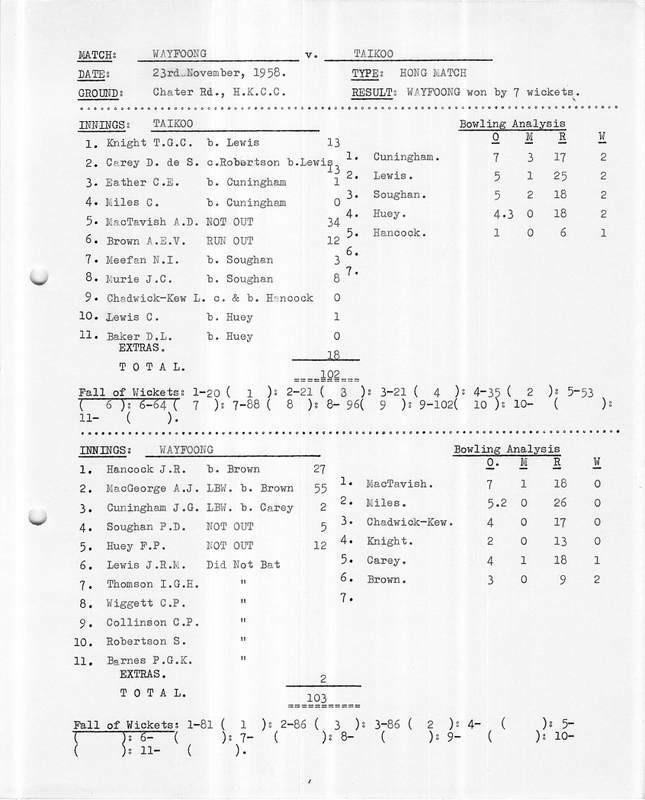 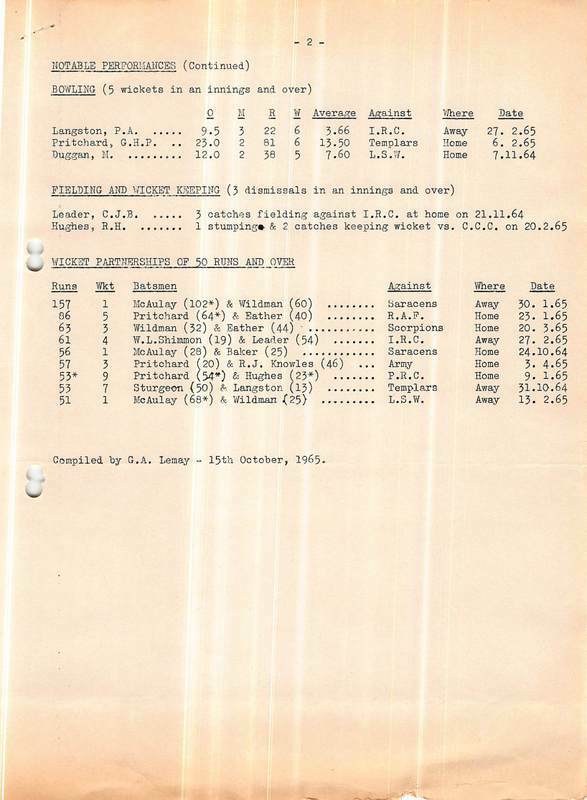 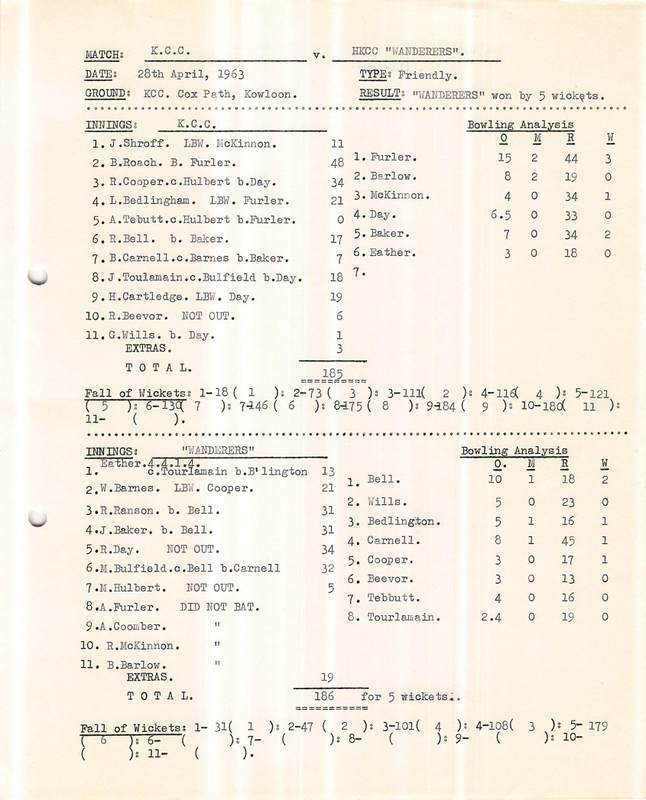 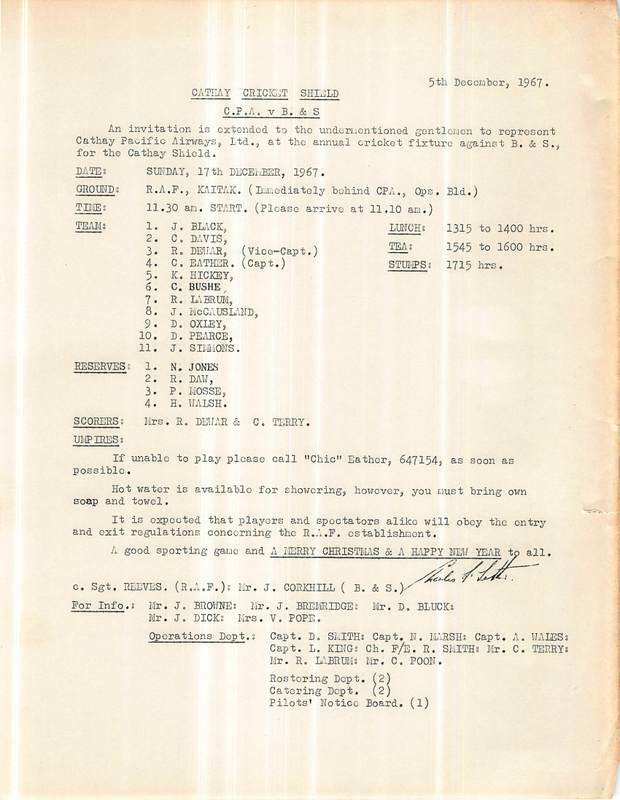 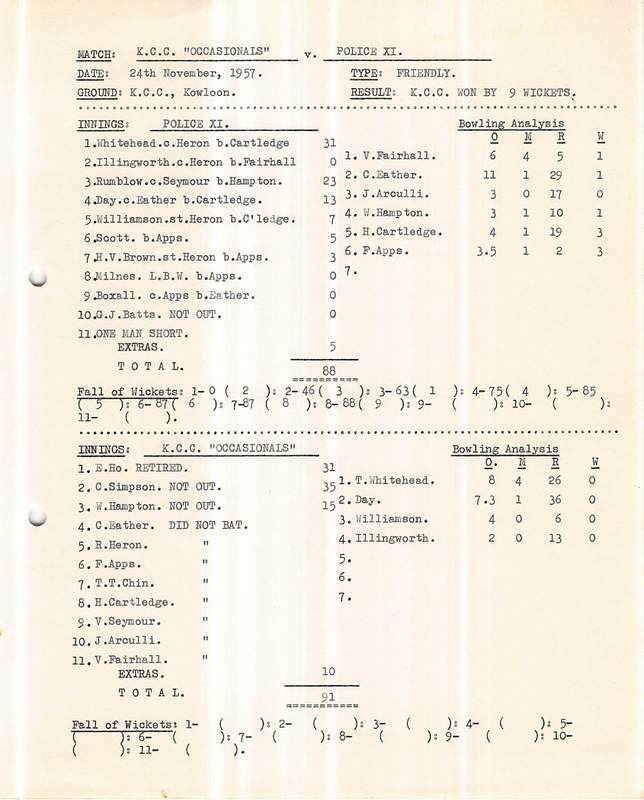 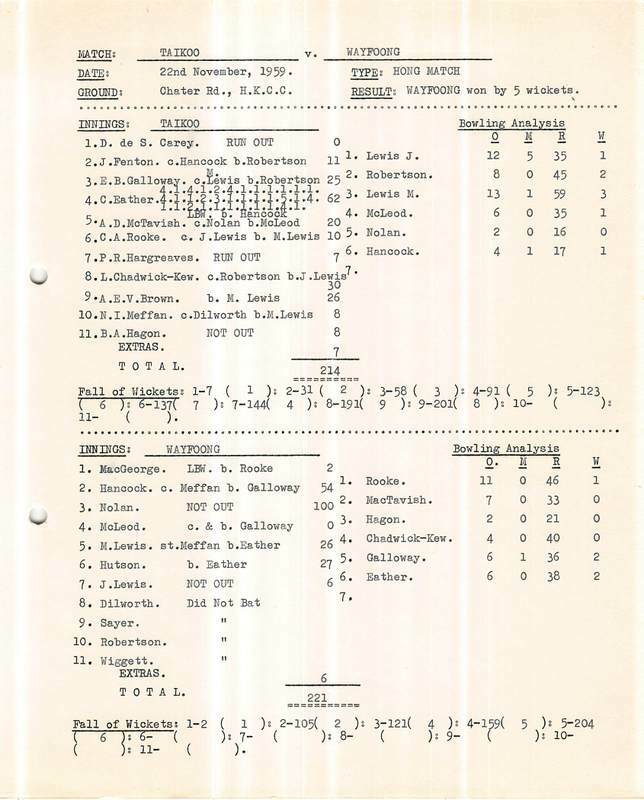 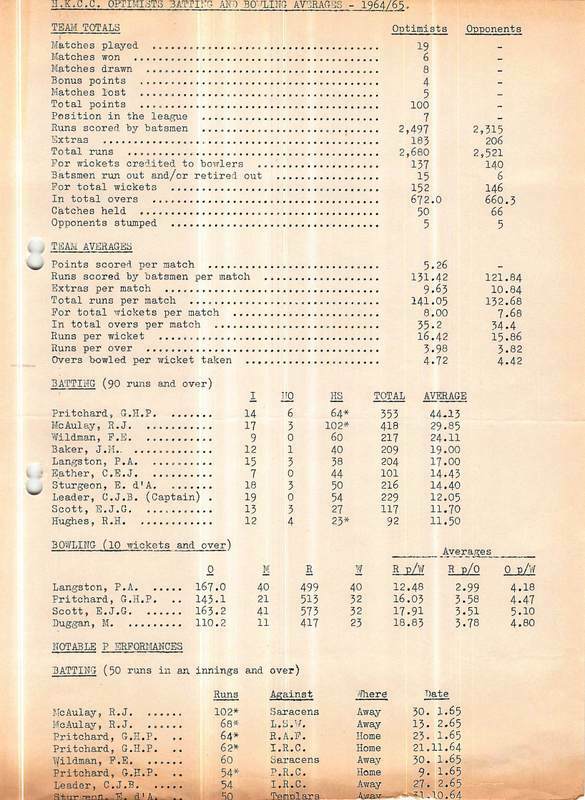 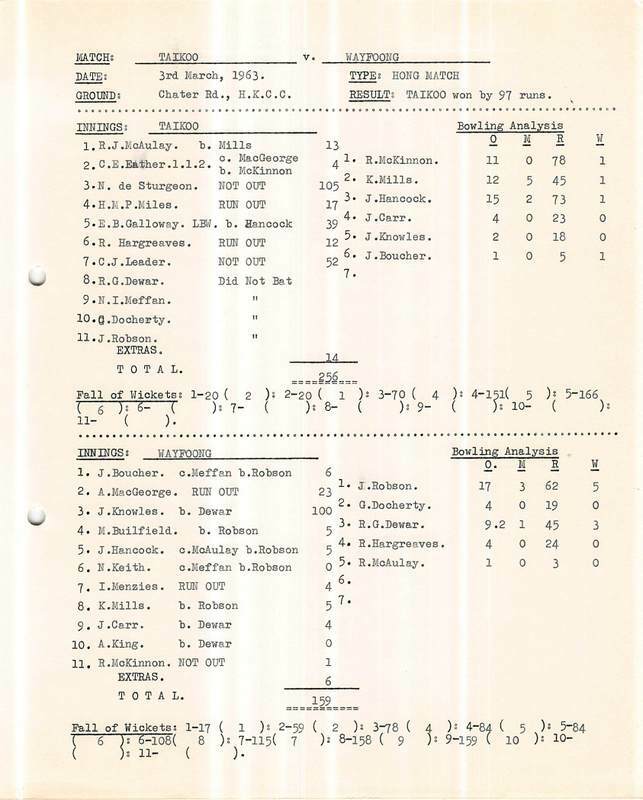 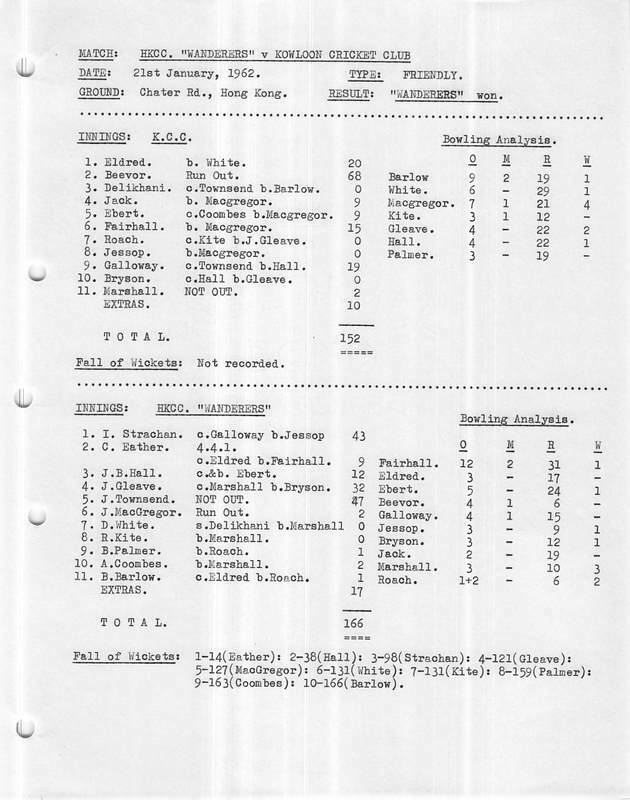 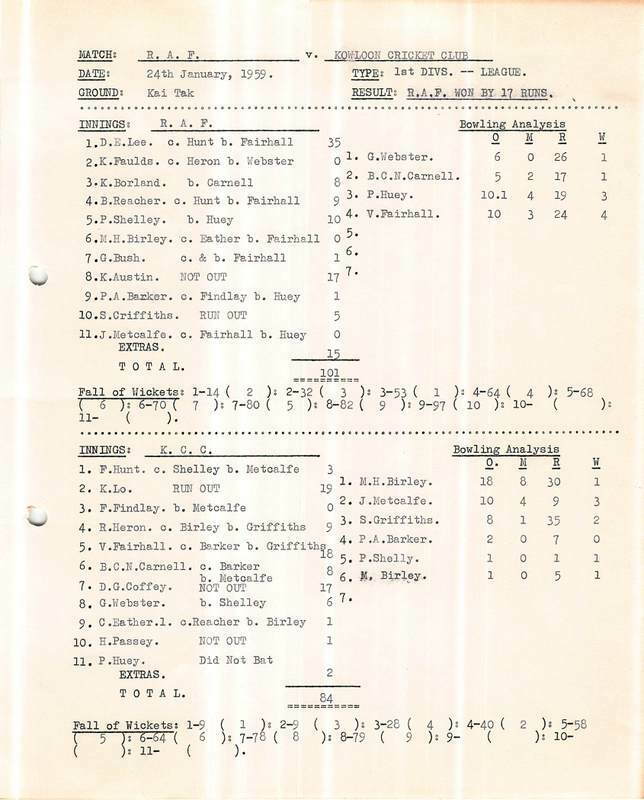 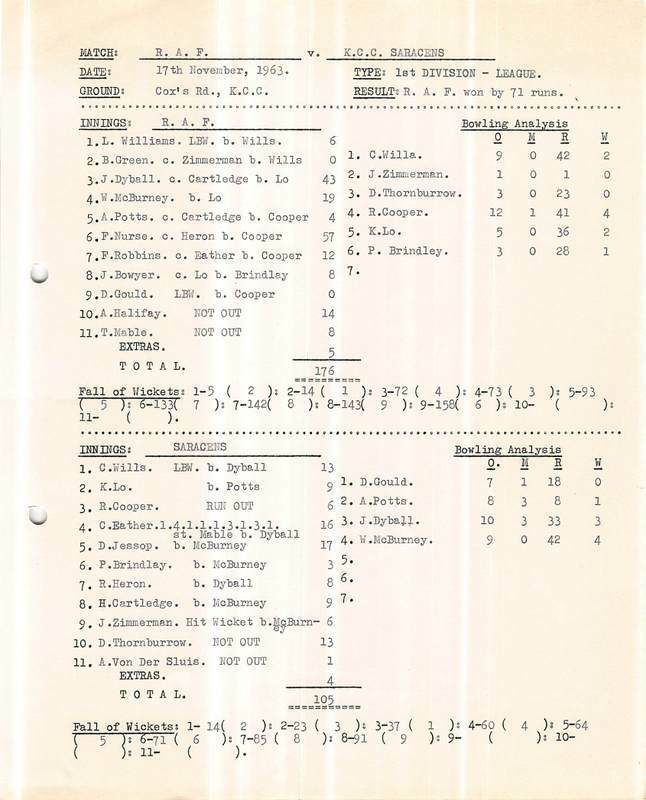 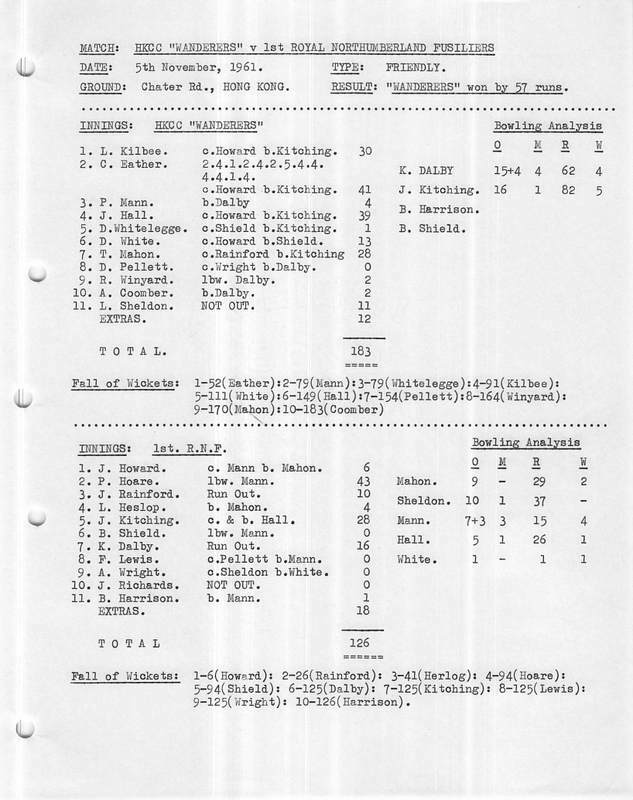 End of Season (1956-1957) Game Combined 2nd Division Vs 1st Division K.C.C. 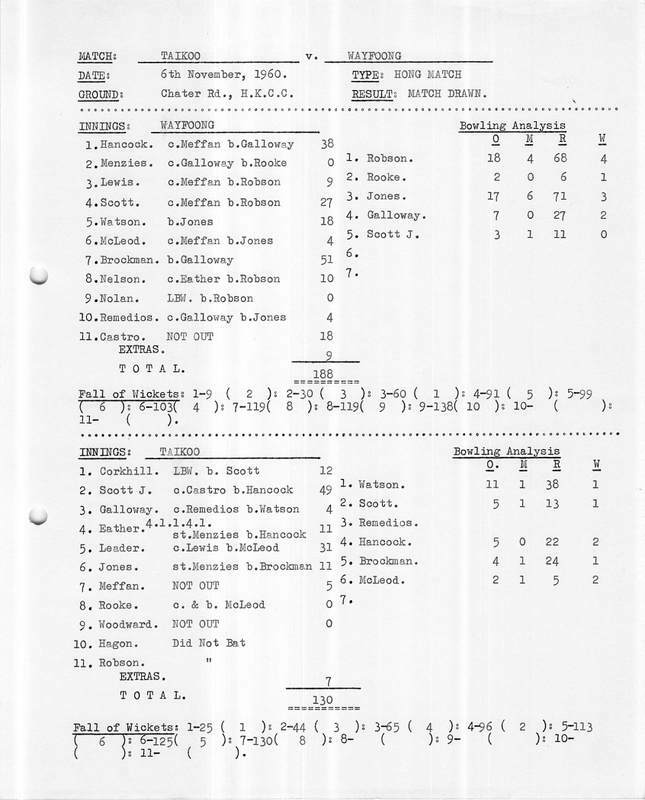 End of Season Game Combined 2nd Division Vs 1st Division K.C.C. 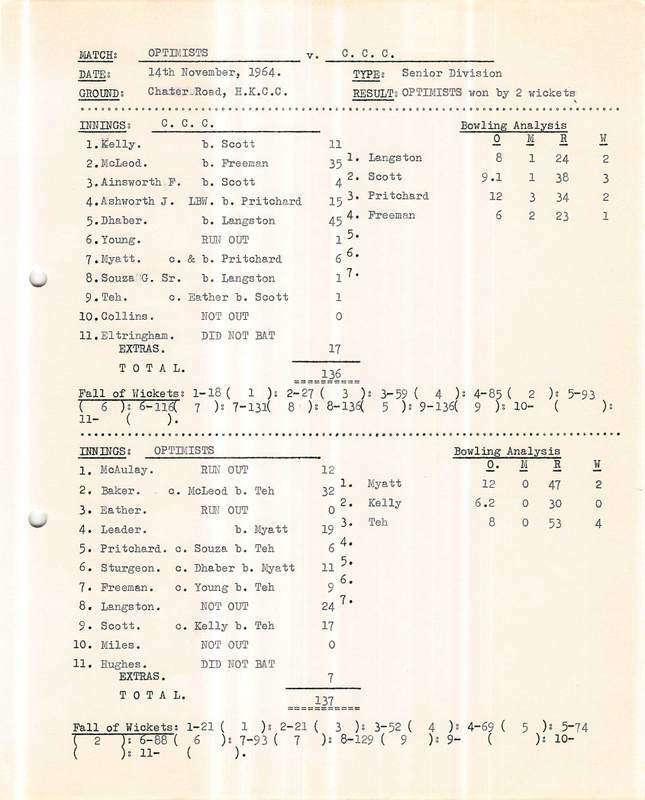 Note: R. Lee passed away during this match. 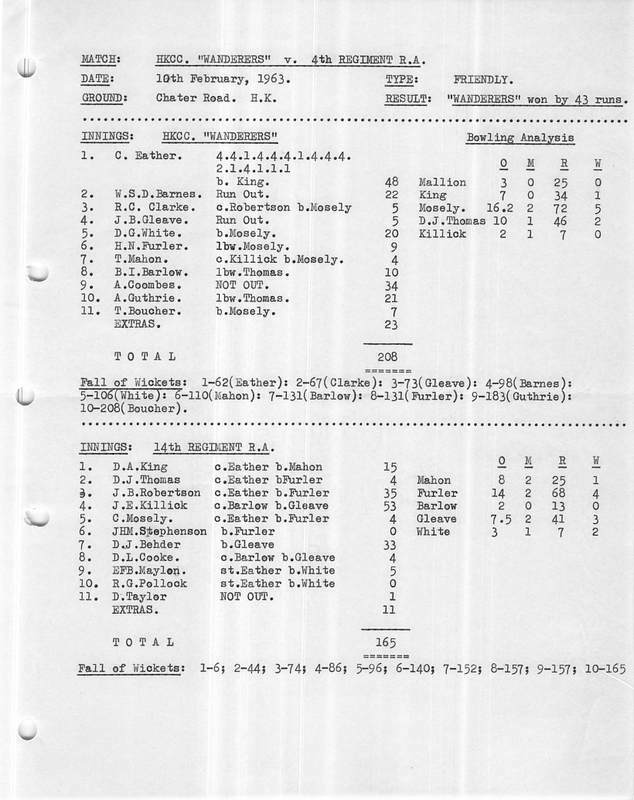 T. LO, B. ROACH, N, HART-BAKER (VICE-CAPT. 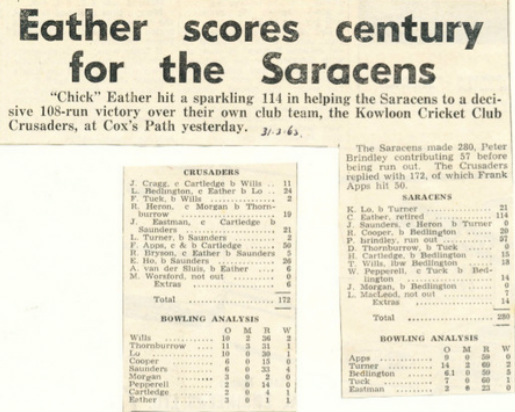 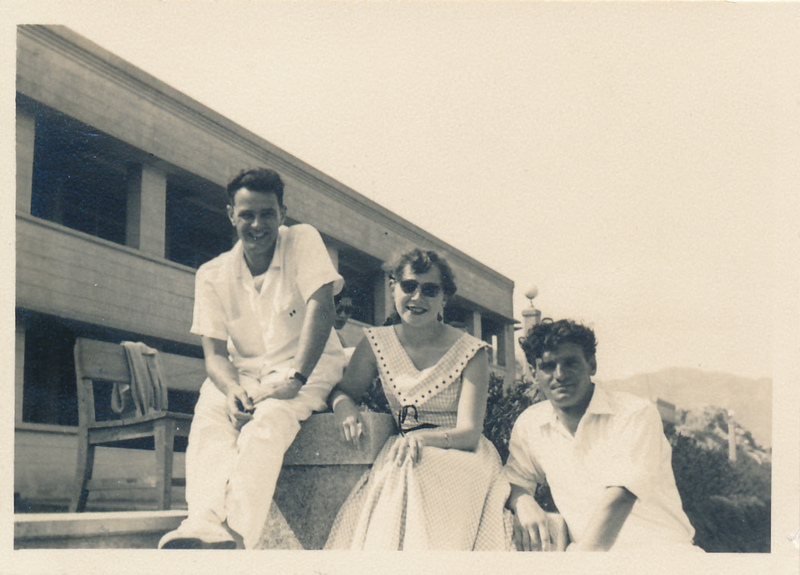 ), MRS B, ROACH (SCORER), C. EATHER (CAPT. 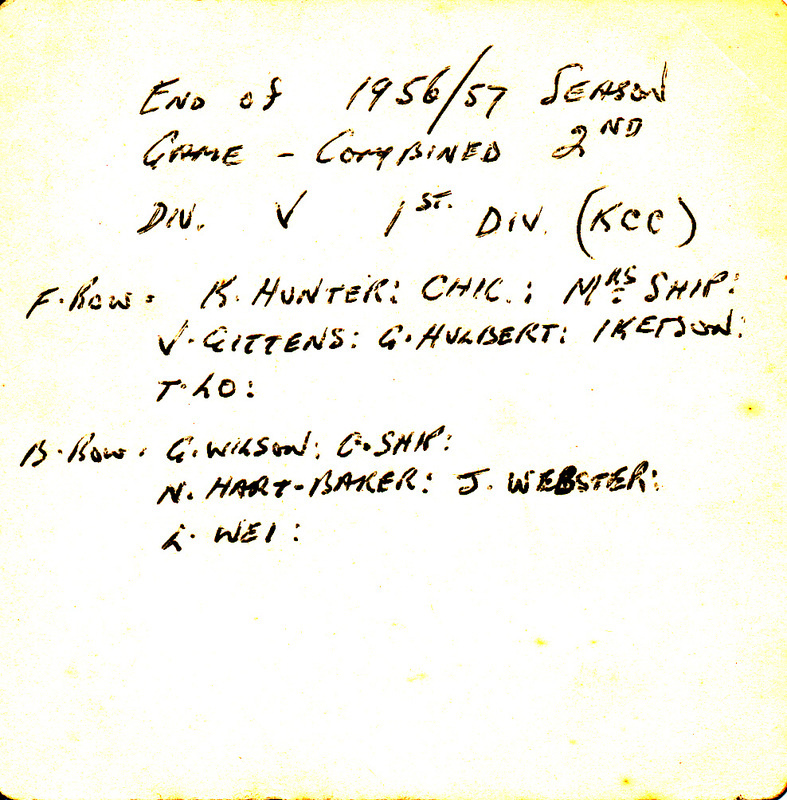 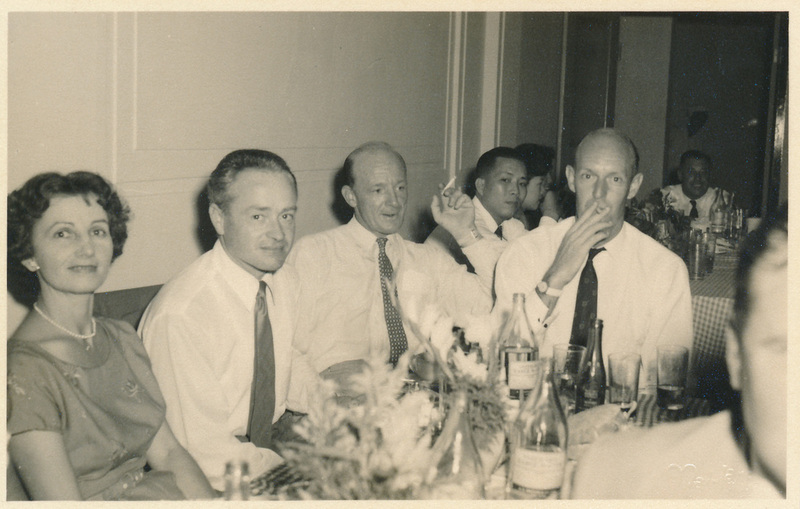 ), R, WILLIAMS, J. WEBSTER, F. KERMANI. 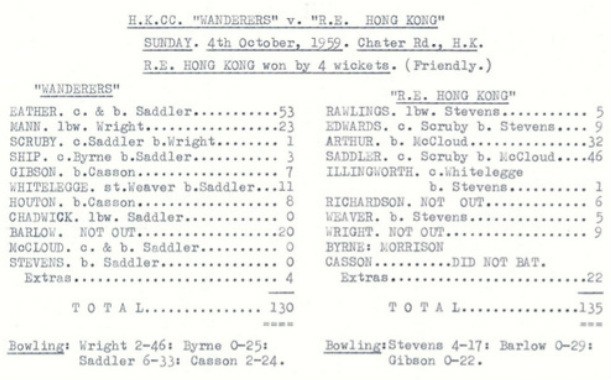 This game was "1 Hour Each" after regular "Hong" match finished early - see above.